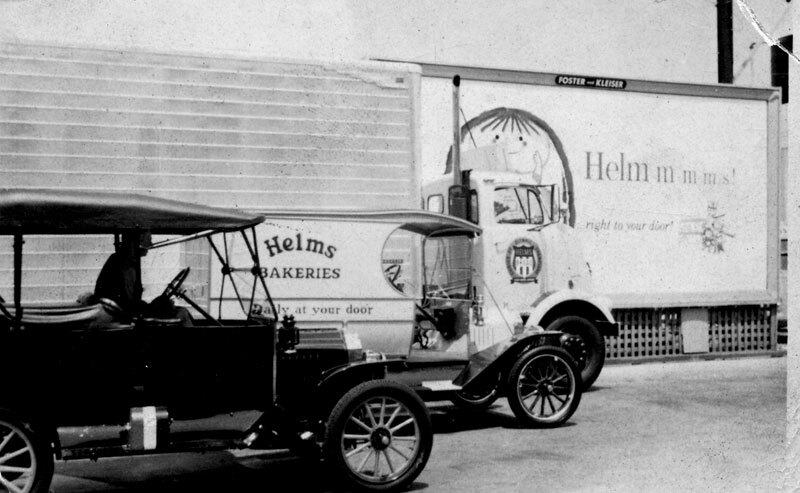 Early Helms coach and billboard. 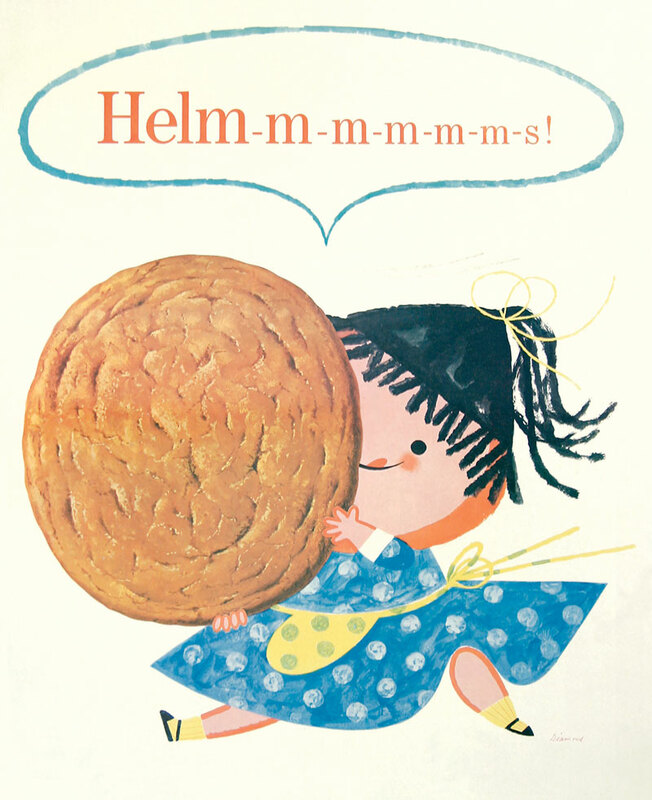 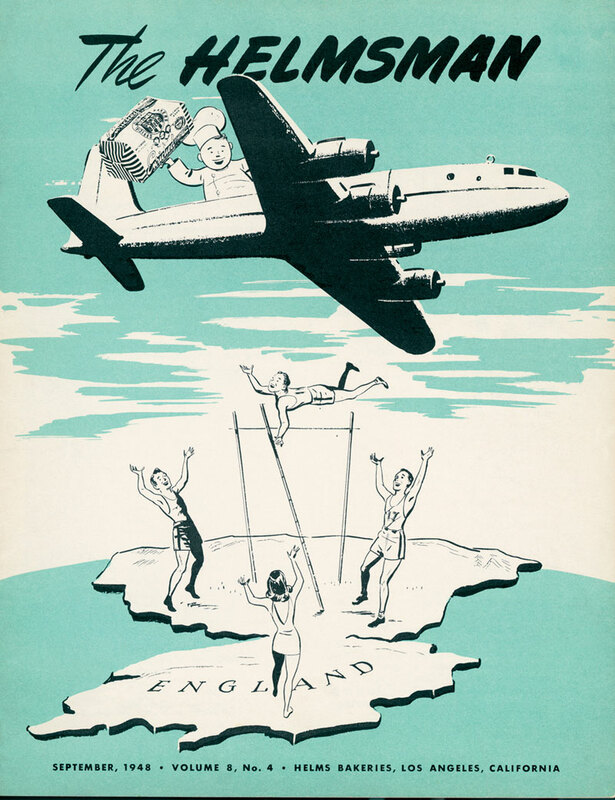 An illustrated Helms Bakery poster. 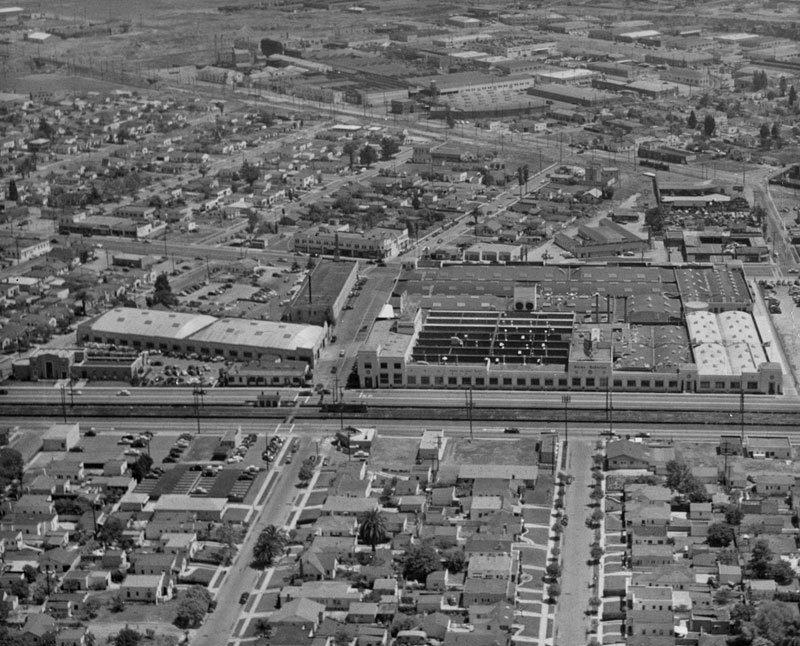 Goodyear blimp aerial view from 1933. 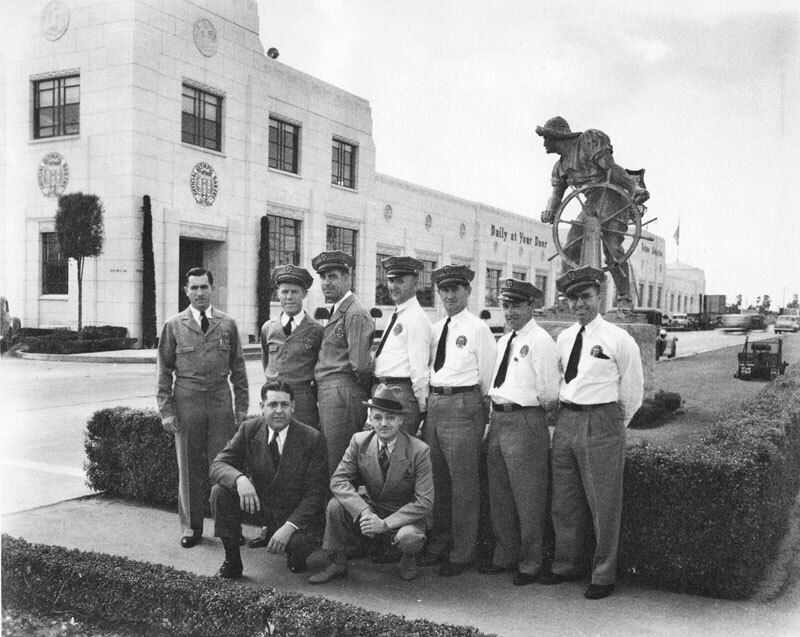 Helmsmen posing for pictures on the center divider of Venice Blvd. 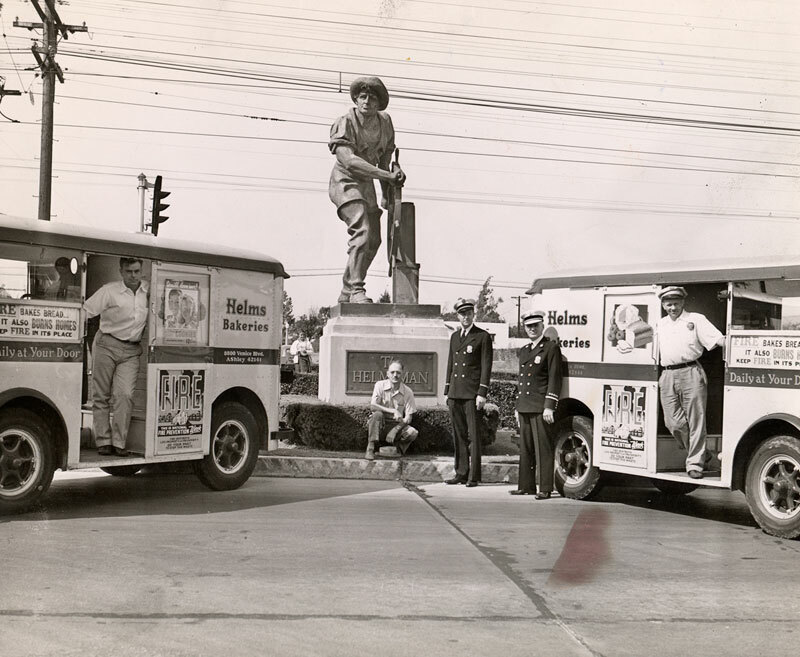 The original Helmsman statue is currently located at Burton Chase Park in Marina Del Rey. 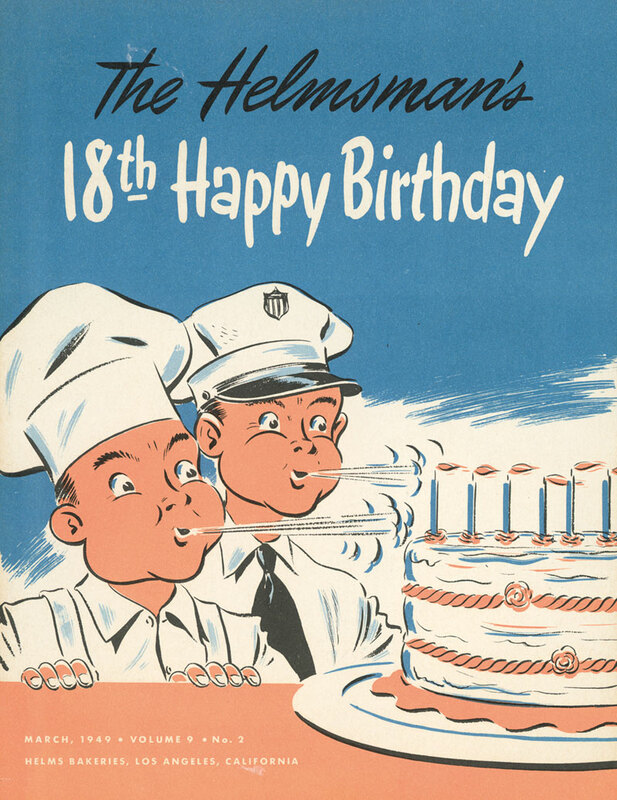 The Helmsman magazine, September, 1948. 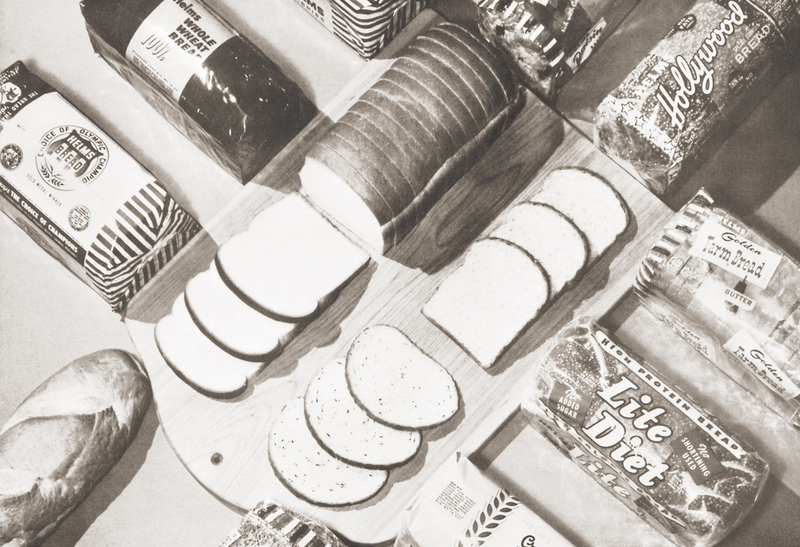 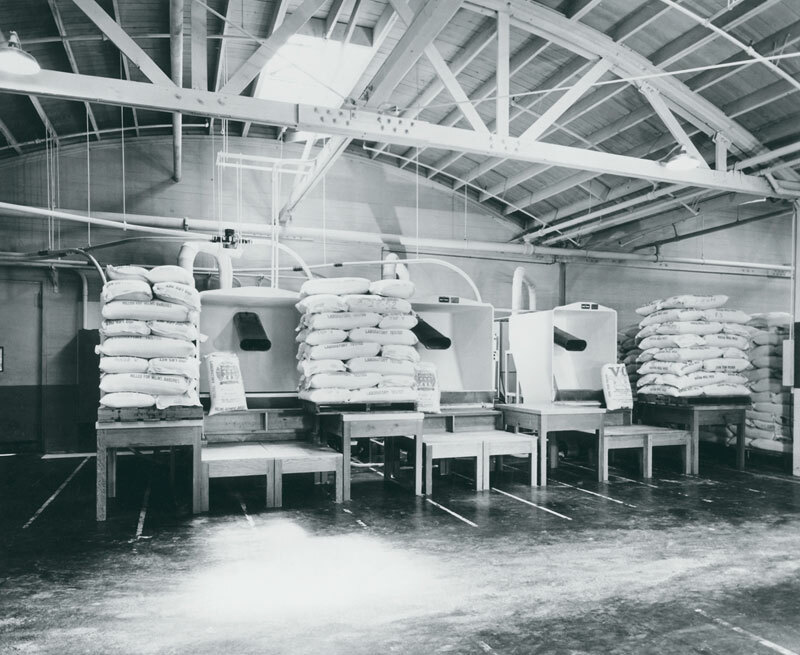 The many types of bread baked daily. 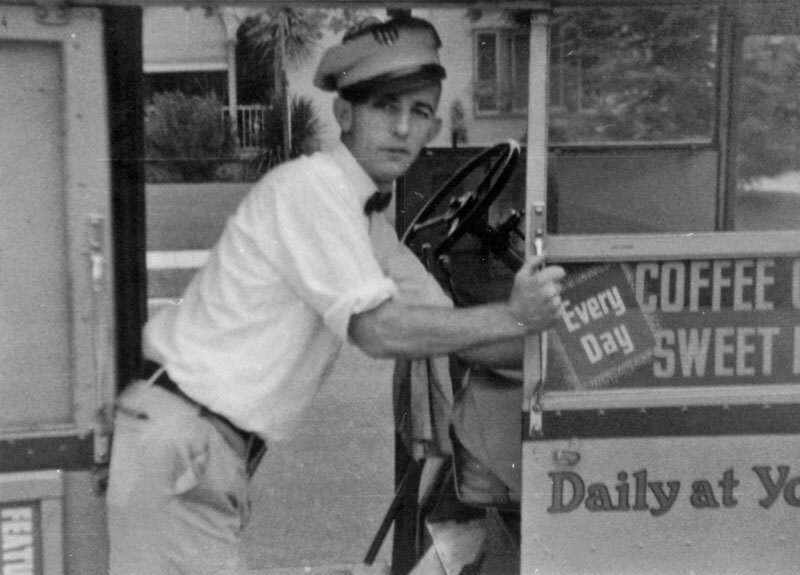 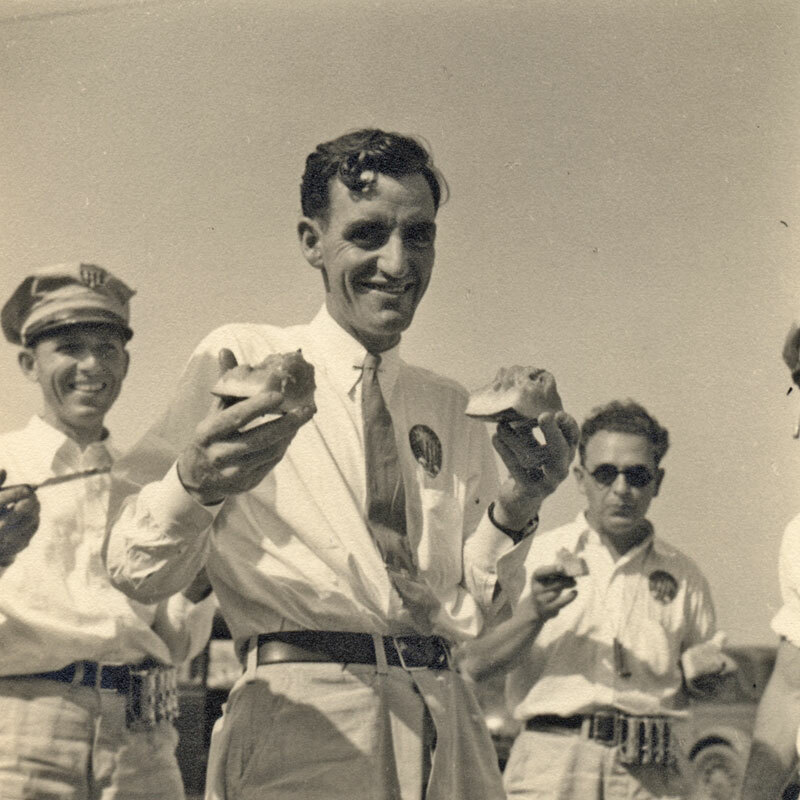 Helmsman Lee Purdy and his 1936 coach. 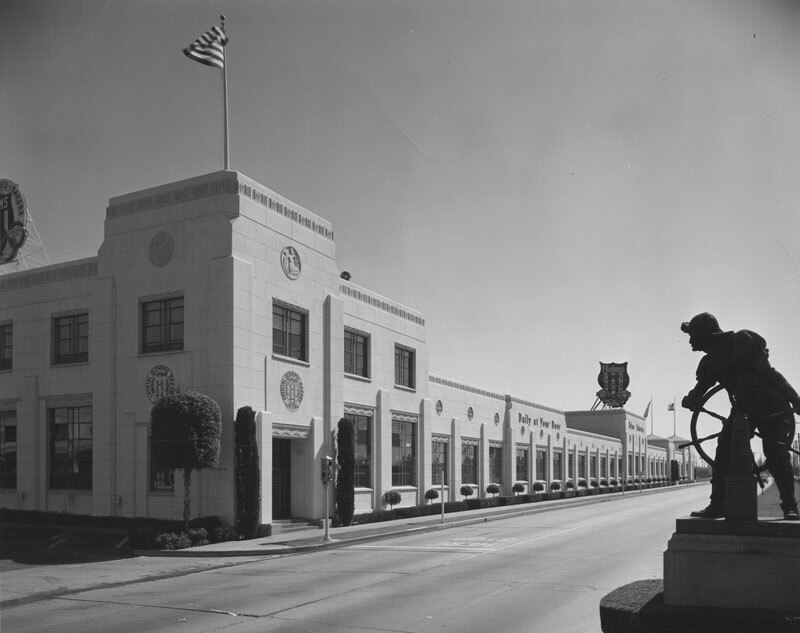 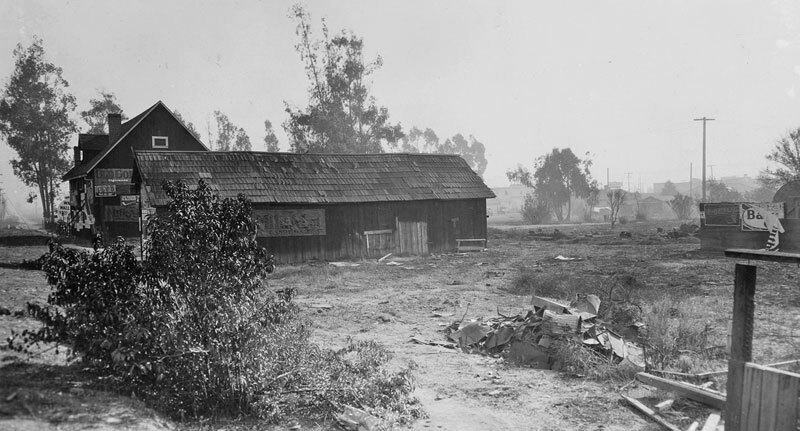 The original Helmsmen in the center divider of Venice Boulevard, looking west. 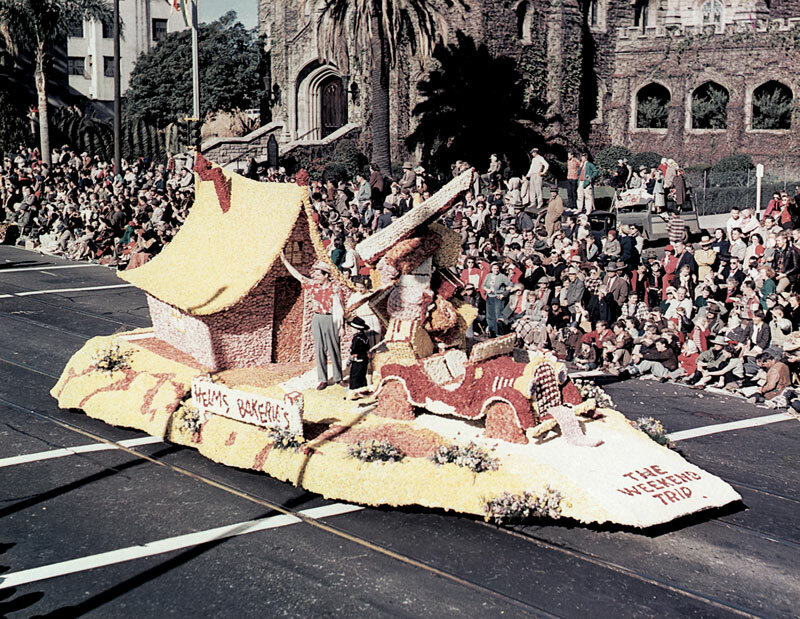 A Helms Bakery float during the Rose Bowl parade on Colorado Blvd. 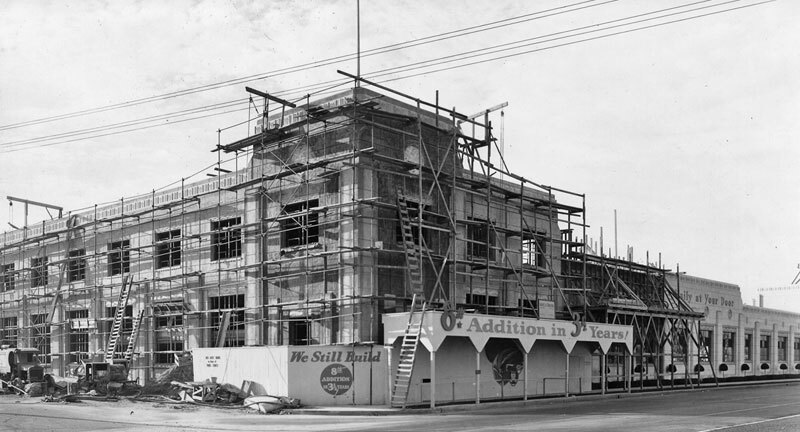 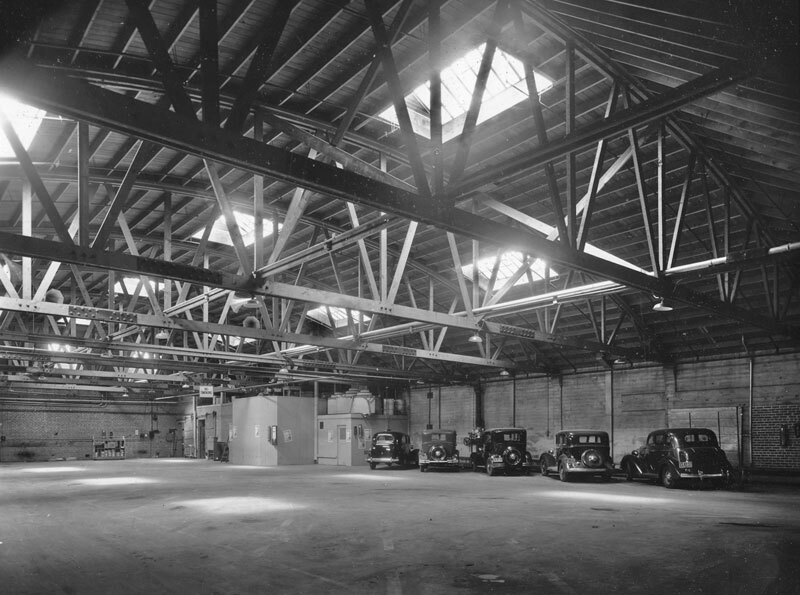 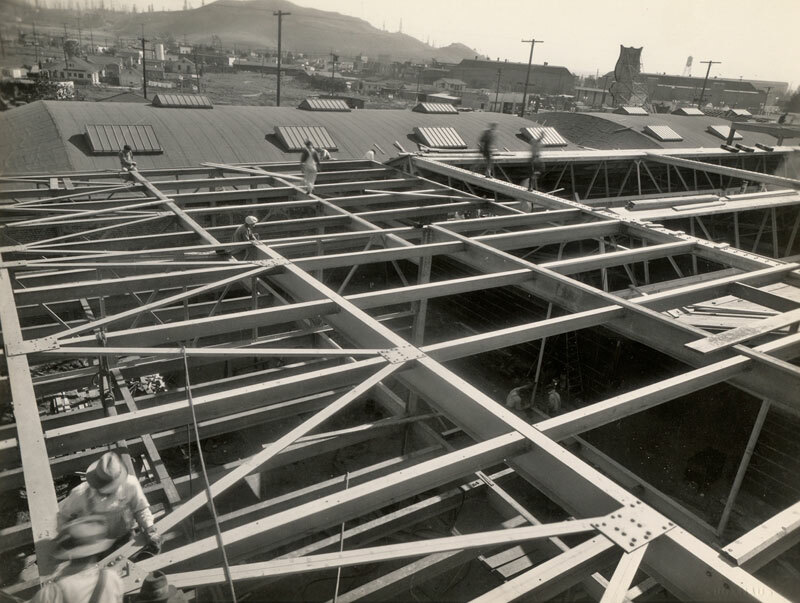 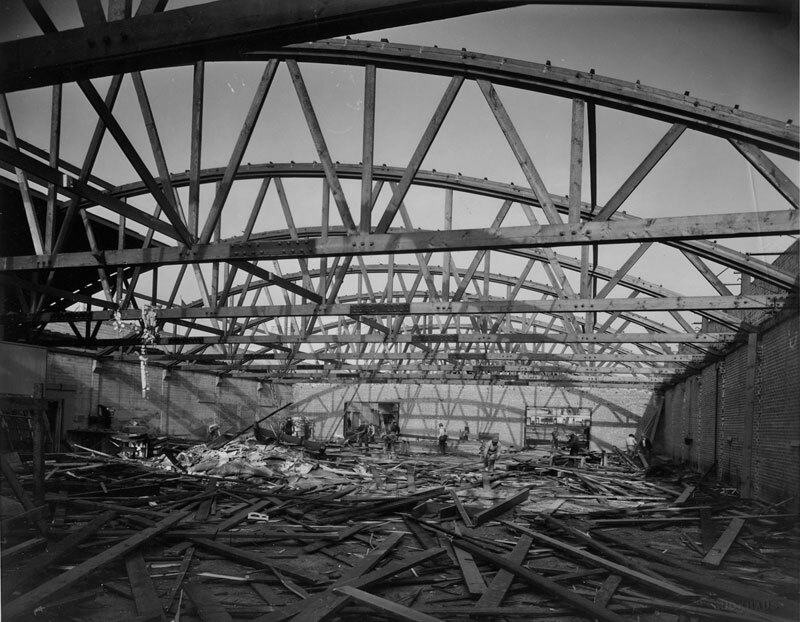 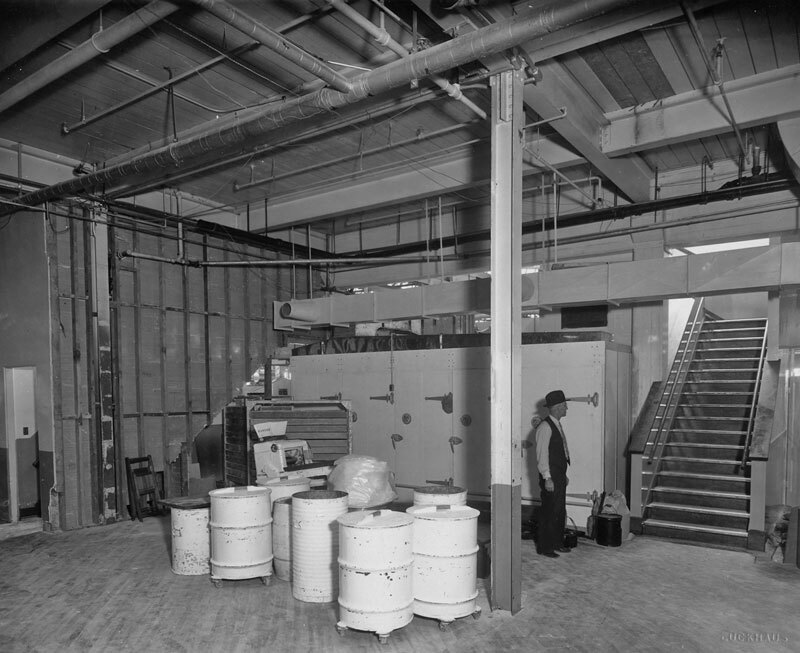 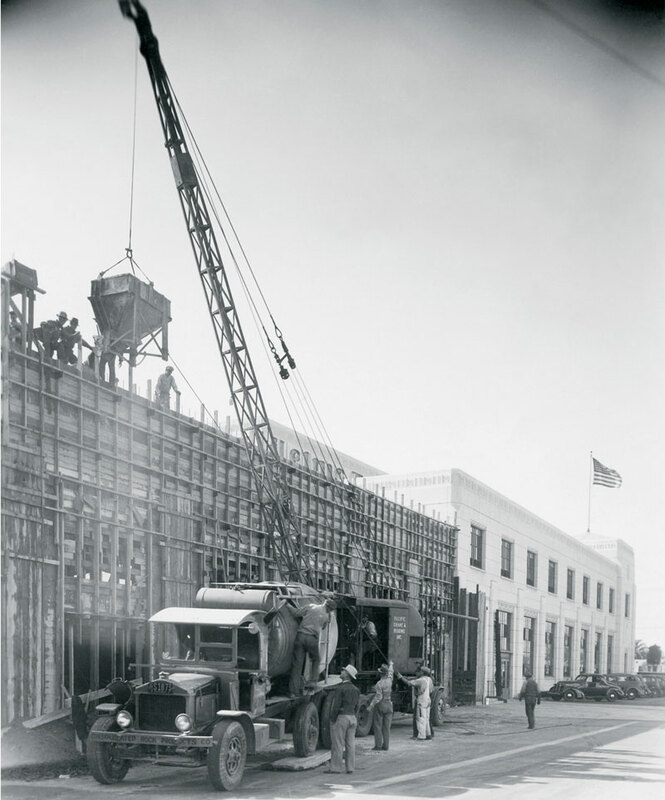 Construction of the bakery adjacent to the original Beacon Laundry building. 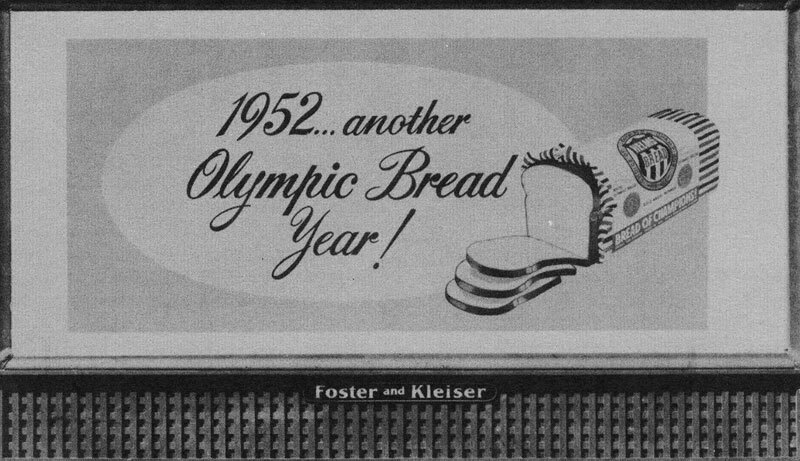 A Foster and Kleiser billboard advertisement from 1952. 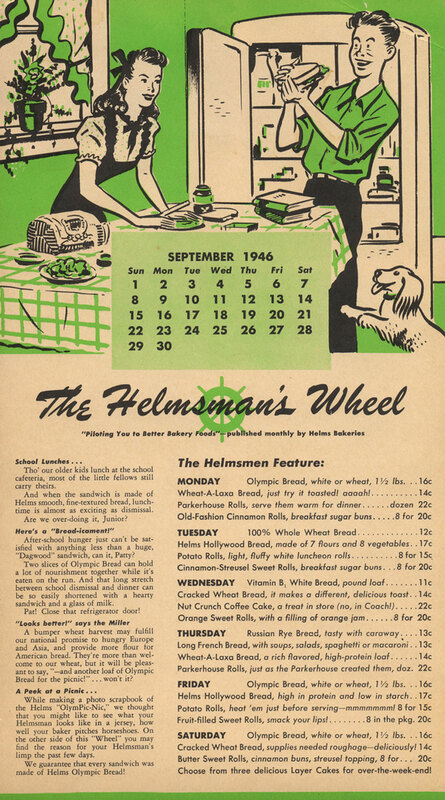 Helmsman's Wheel, a monthly menu feature of the week, 1956. 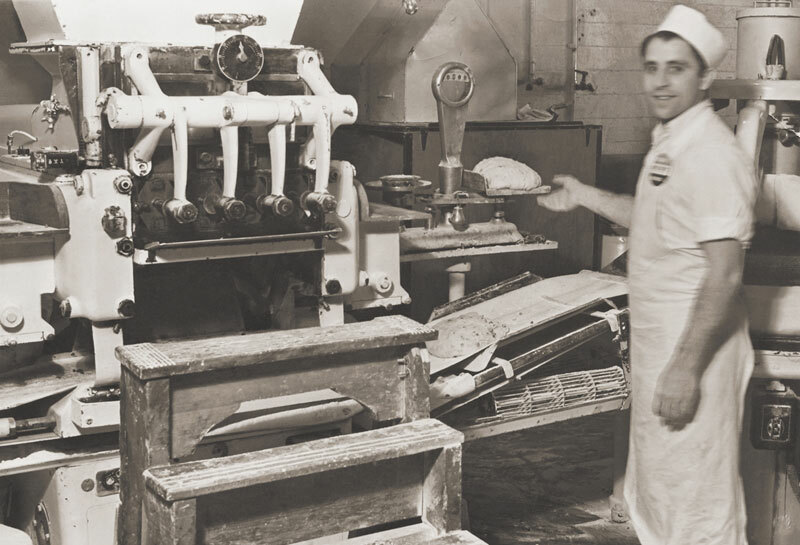 Sending pies into the oven to be baked. 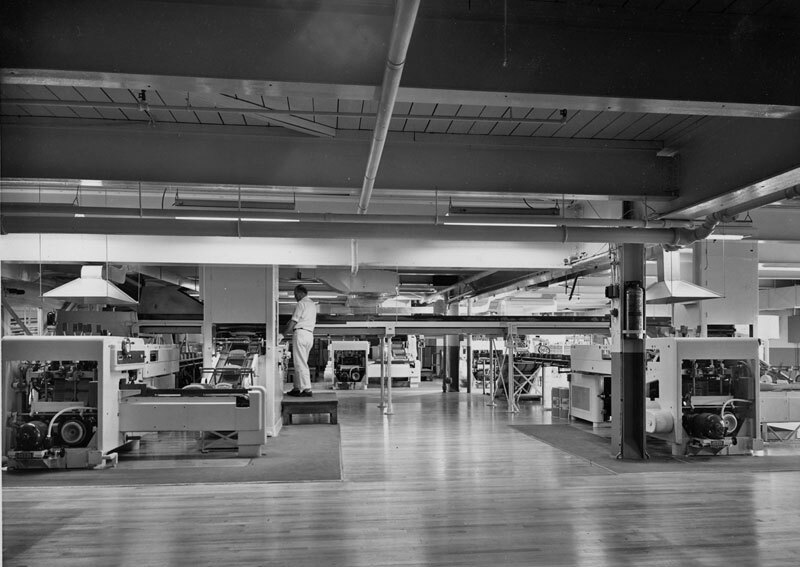 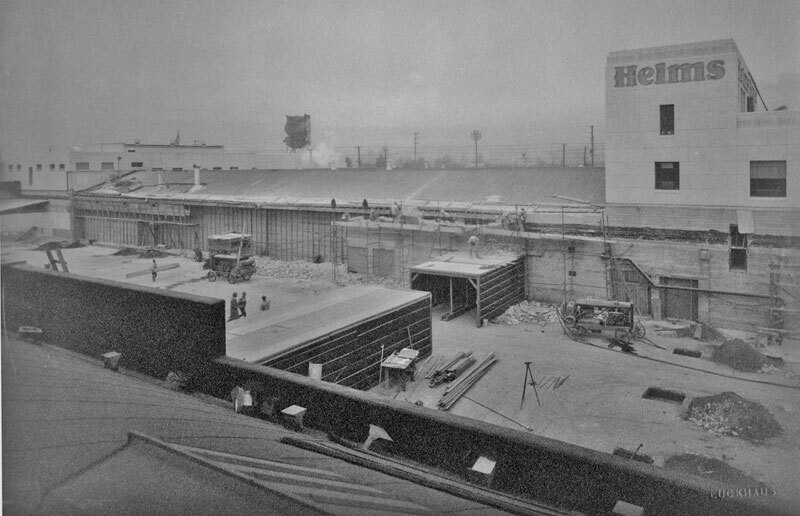 Helms workers diligently packing boxes. 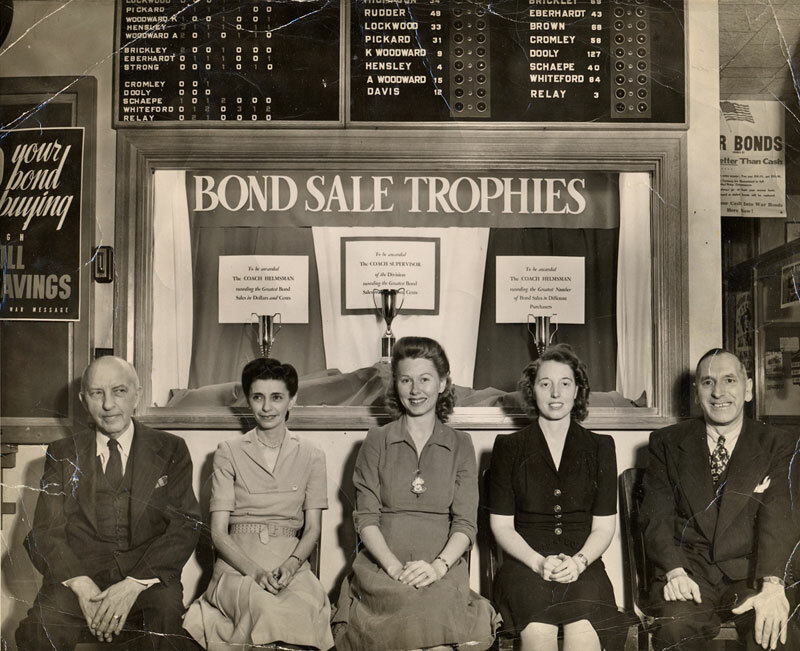 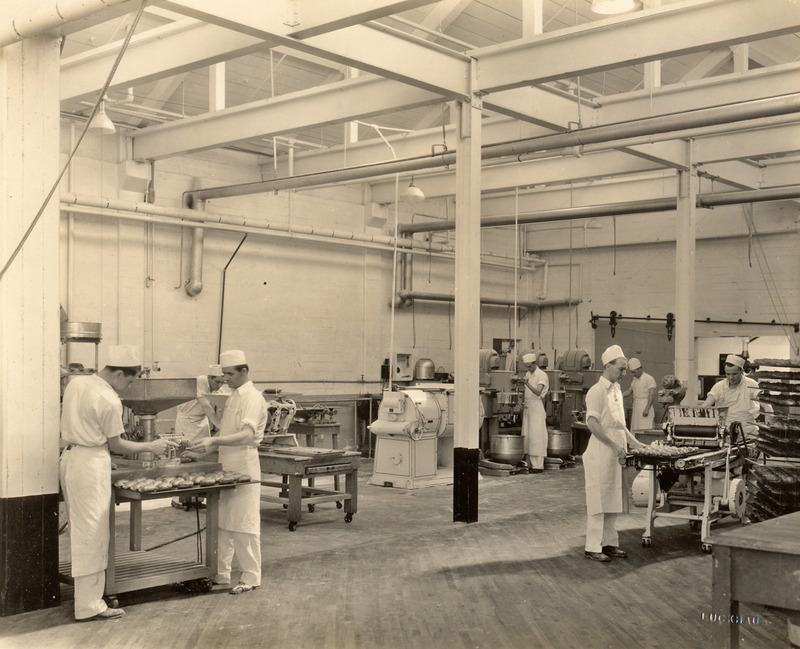 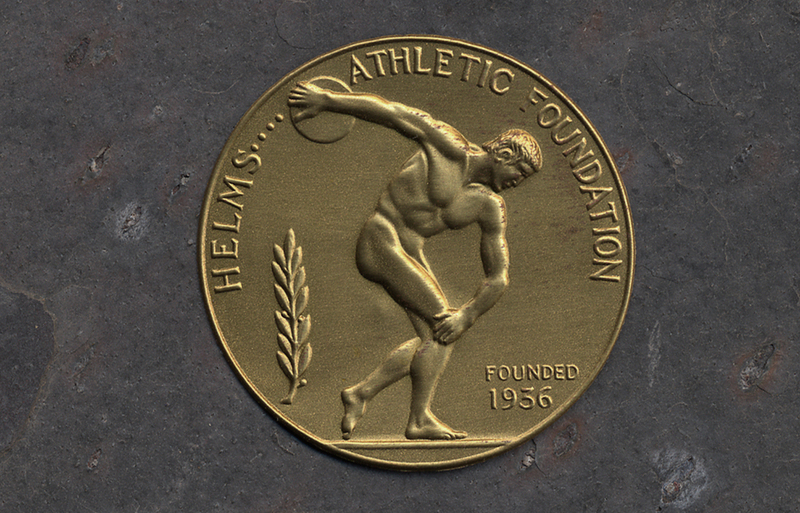 Helms Bakery recipients of their U.S. bond sale awards. 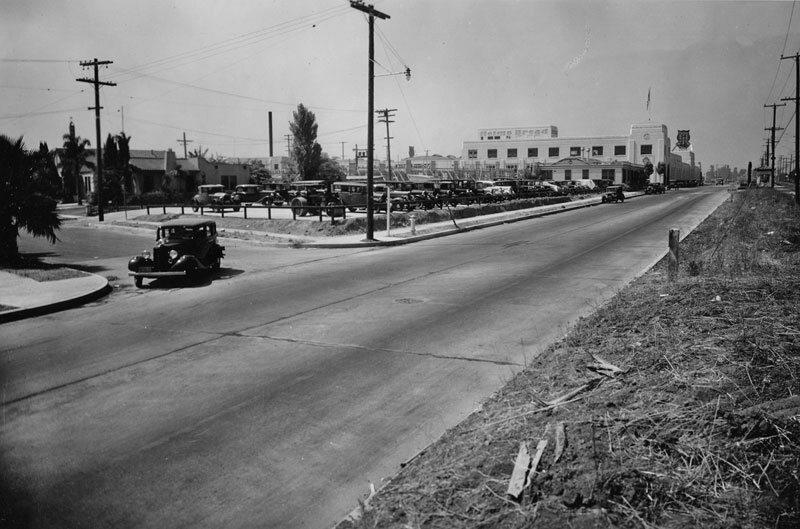 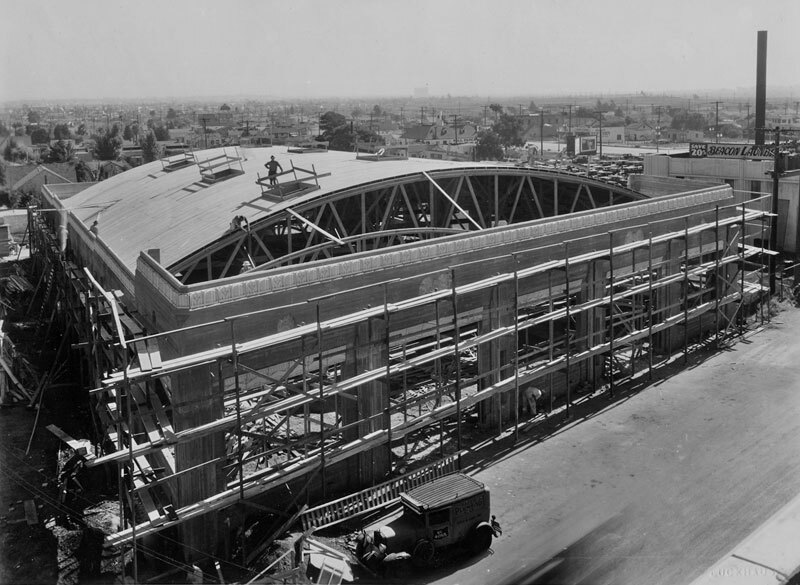 The original construction on Venice and Helms. 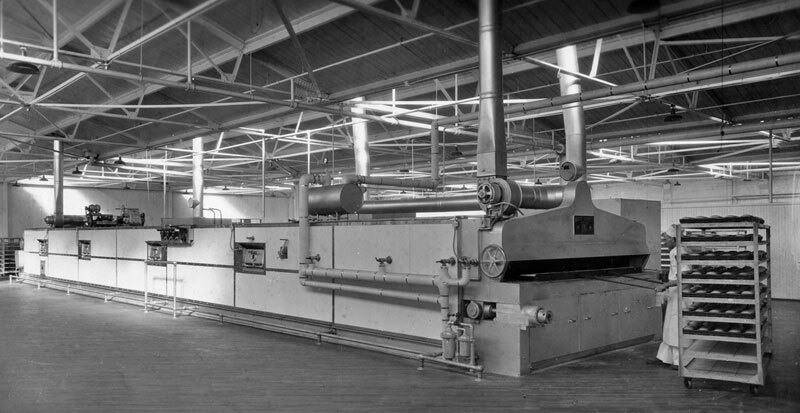 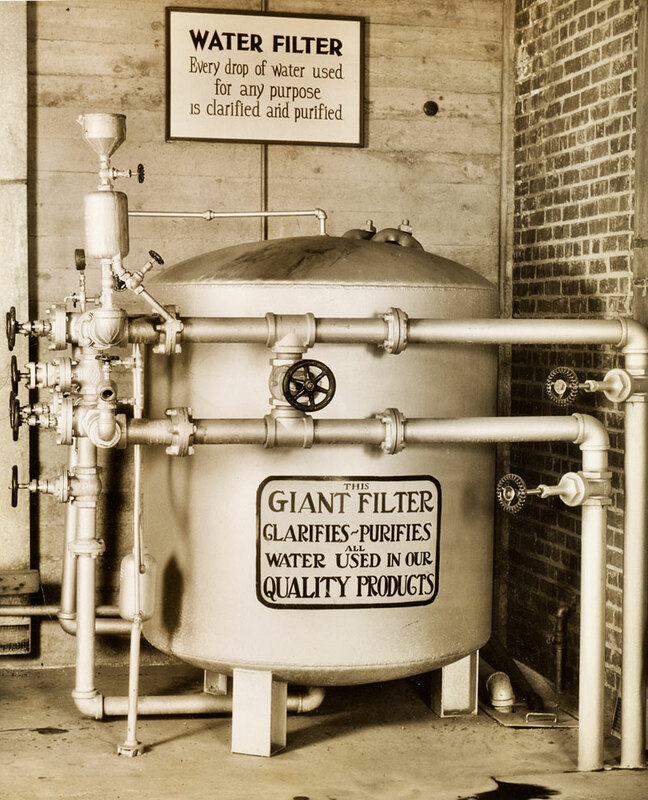 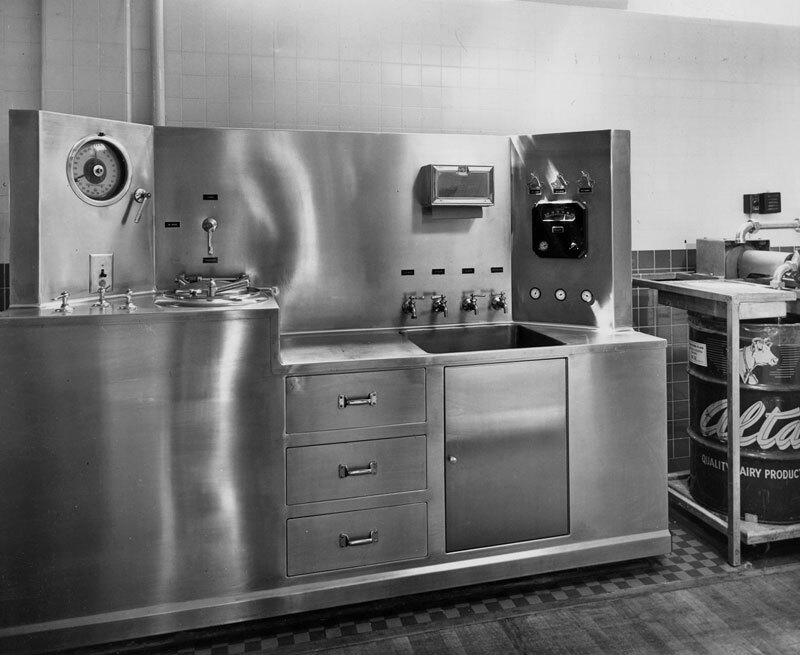 Water purifying system for the Helms Bakery. 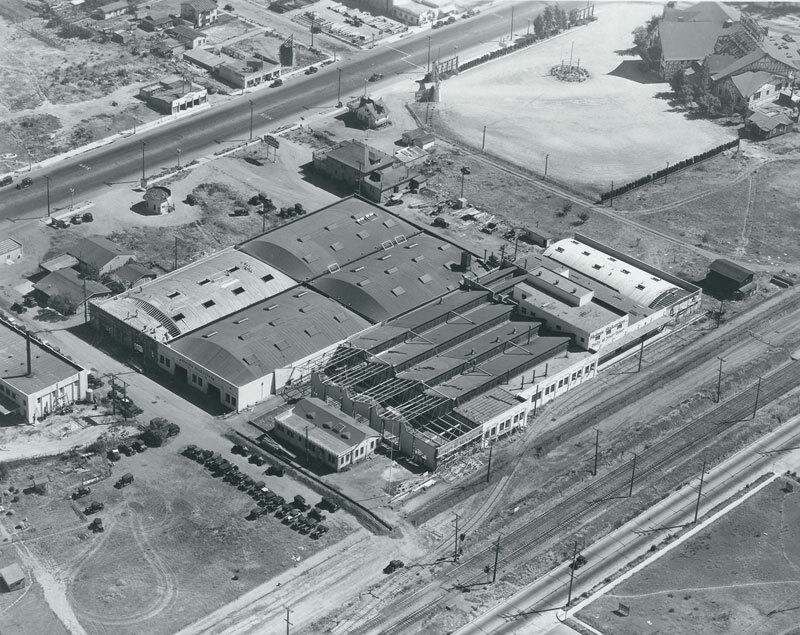 Another aerial view from the Goodyear blimp looking south. 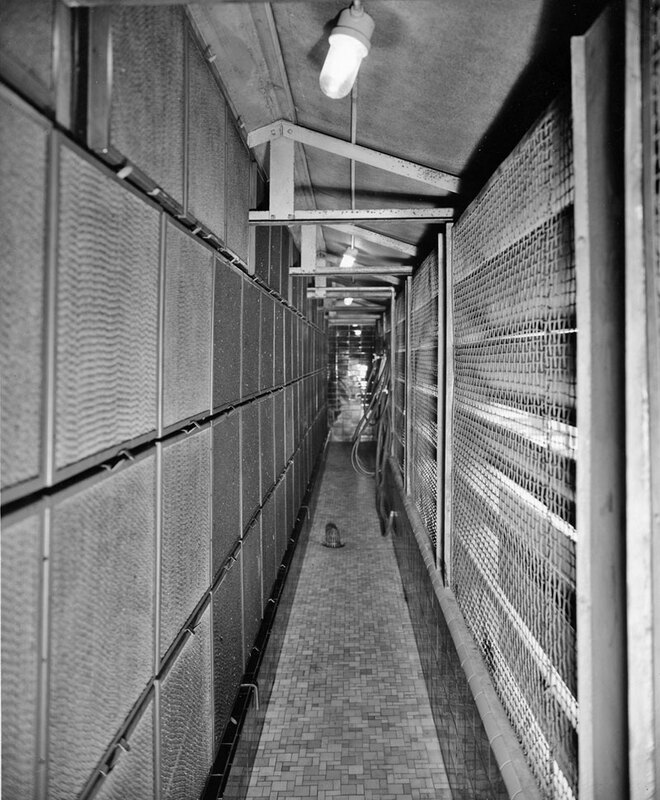 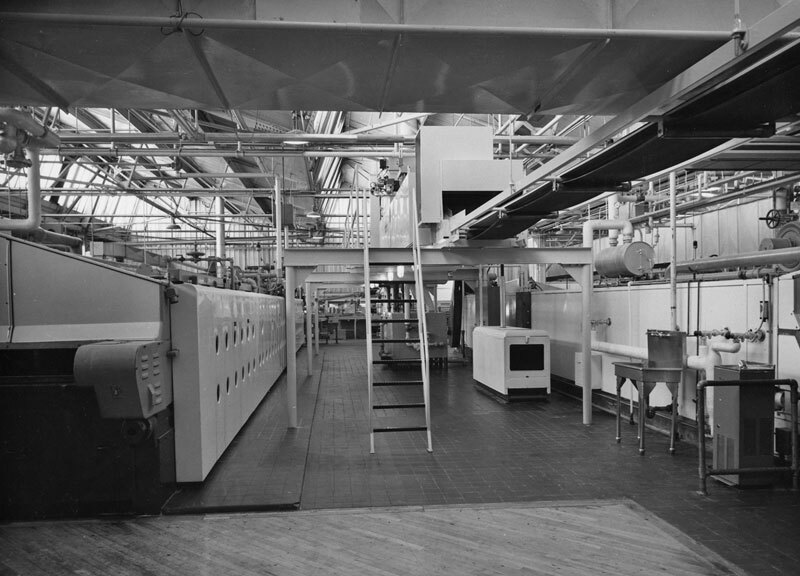 Hall of air conditioning filters. 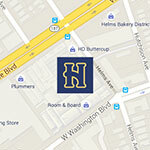 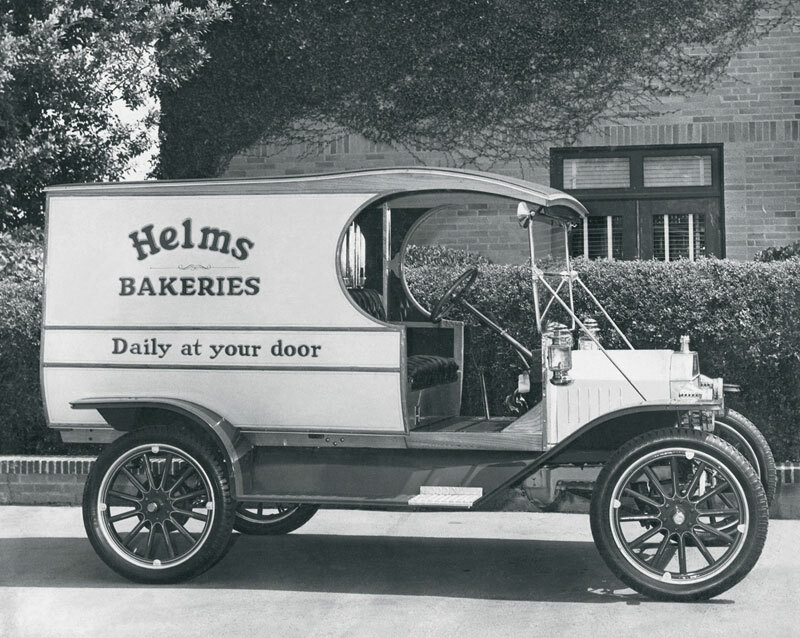 Helms Avenue, "Daily at Your Door" slogan still being used today at the Helms Bakery District. 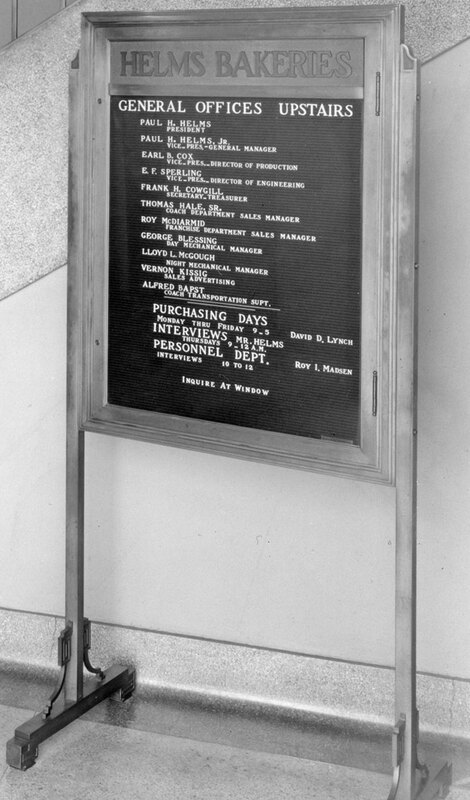 The office directory located in the Helms lobby on the corner of Helms and Venice Boulevard. 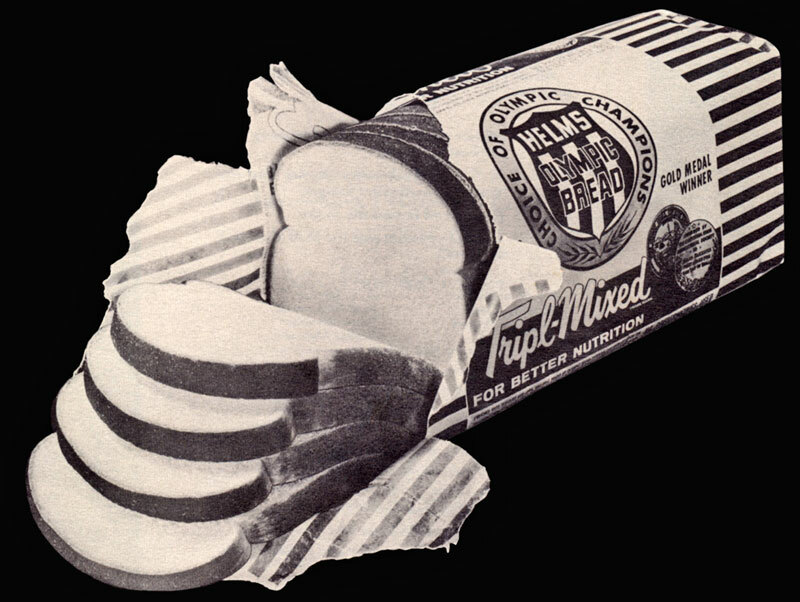 A loaf of Helms Tripl-Mixed Olympic bread. 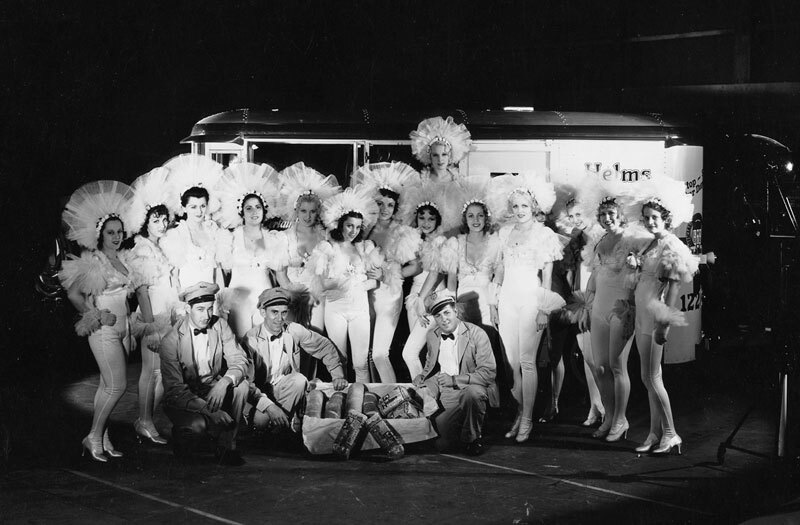 Helmsmen posing with showgirls and bread. 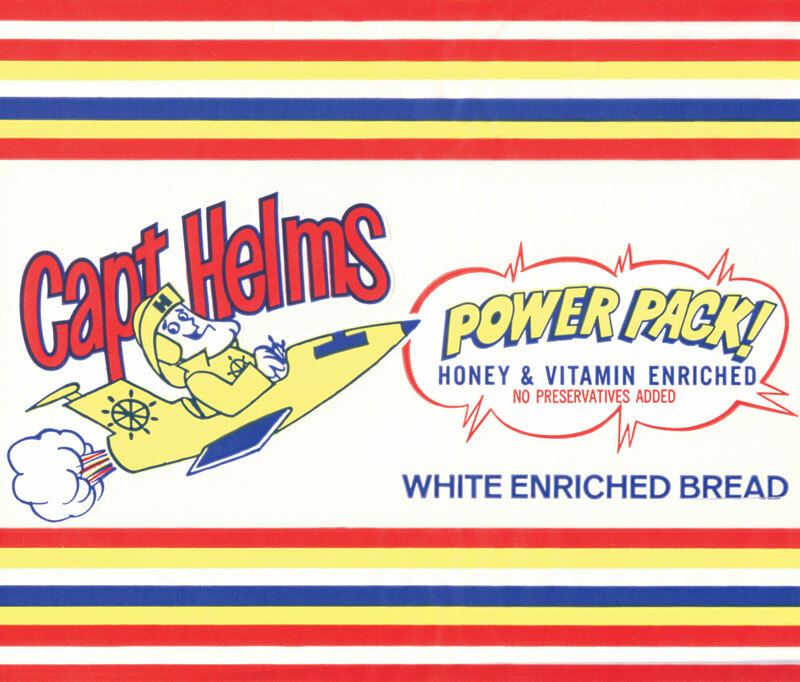 A Helms "OlymPic-Nic" photo collage. 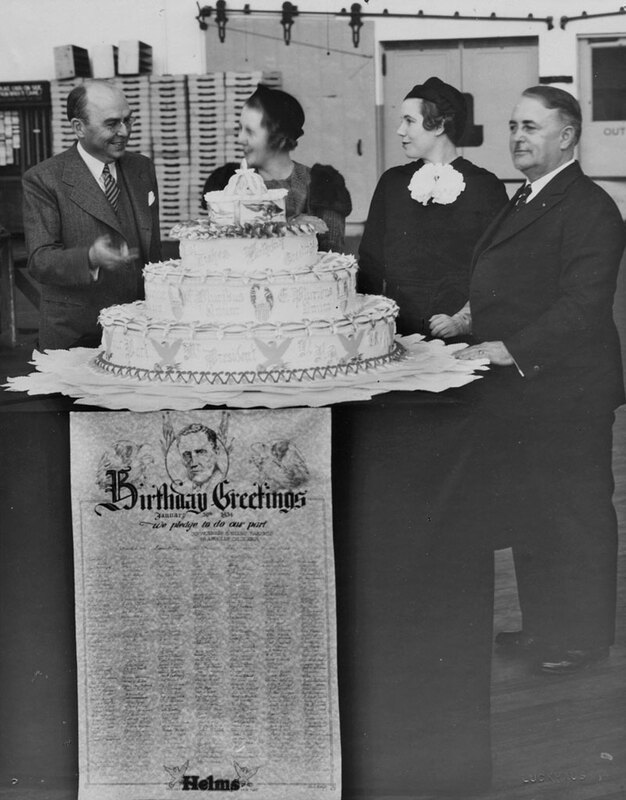 Mr. Helms & Kissig 1934. 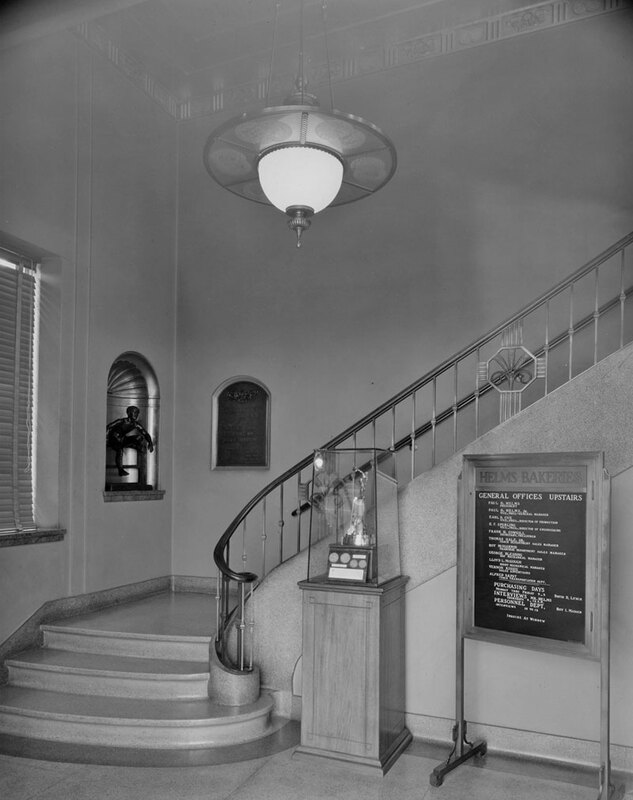 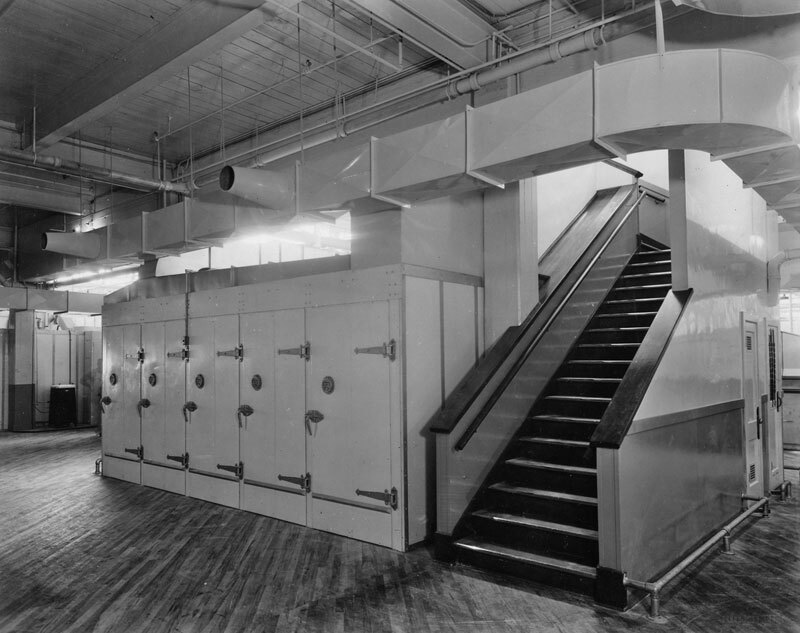 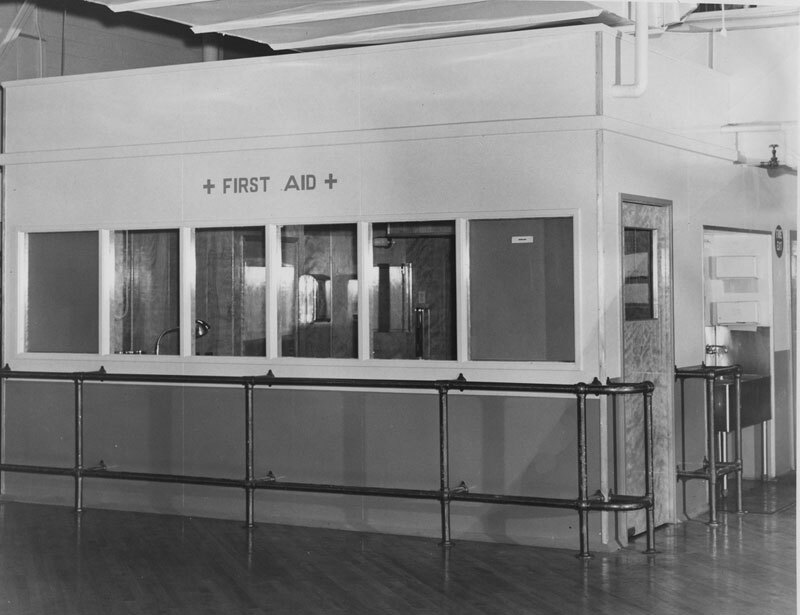 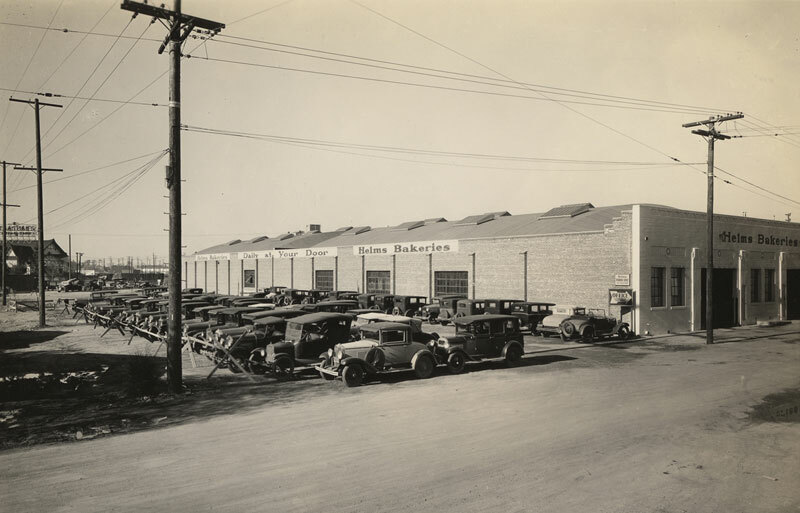 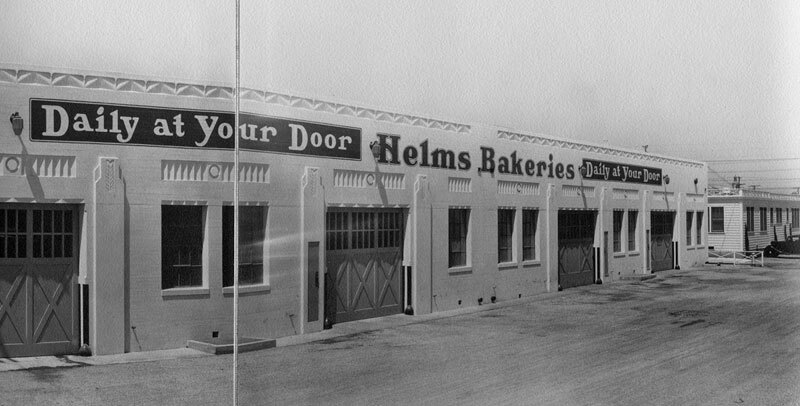 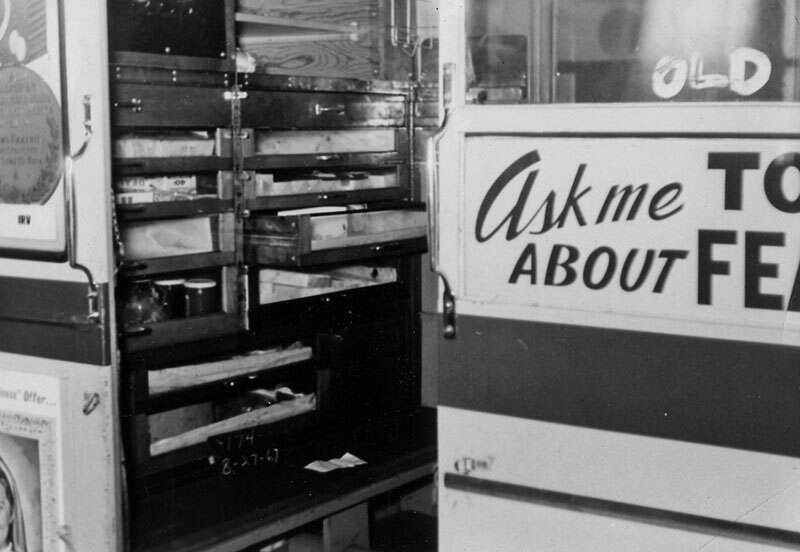 The original Helms Bakery lobby entrance is still located on the corner of Venice and Helms. 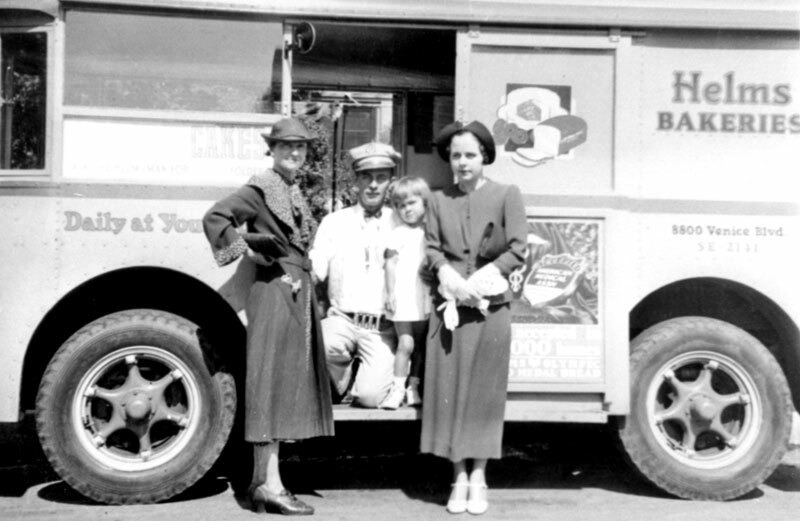 Helmsmen posing for a picture with his family. 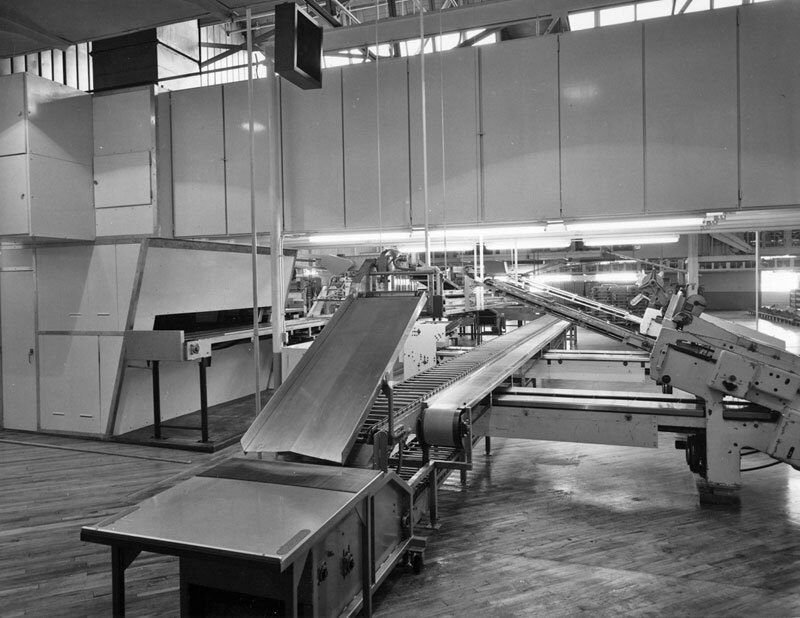 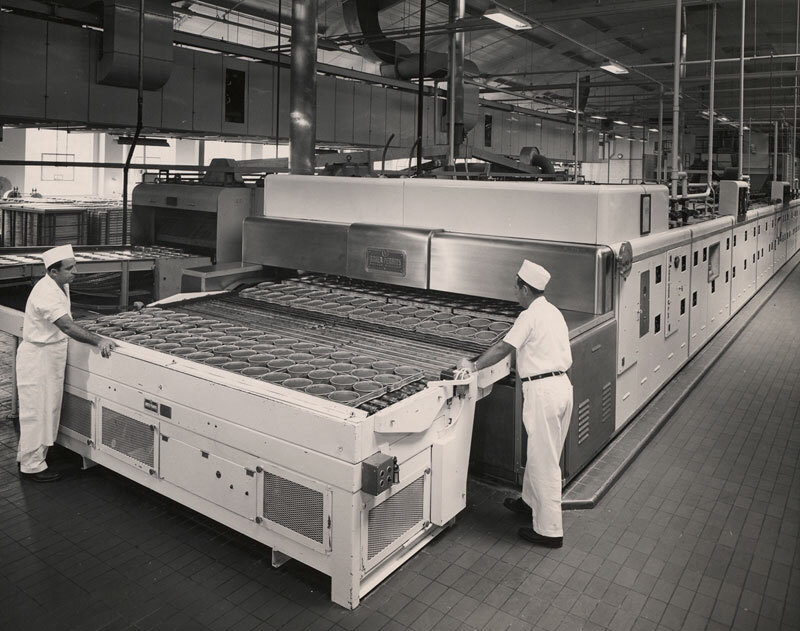 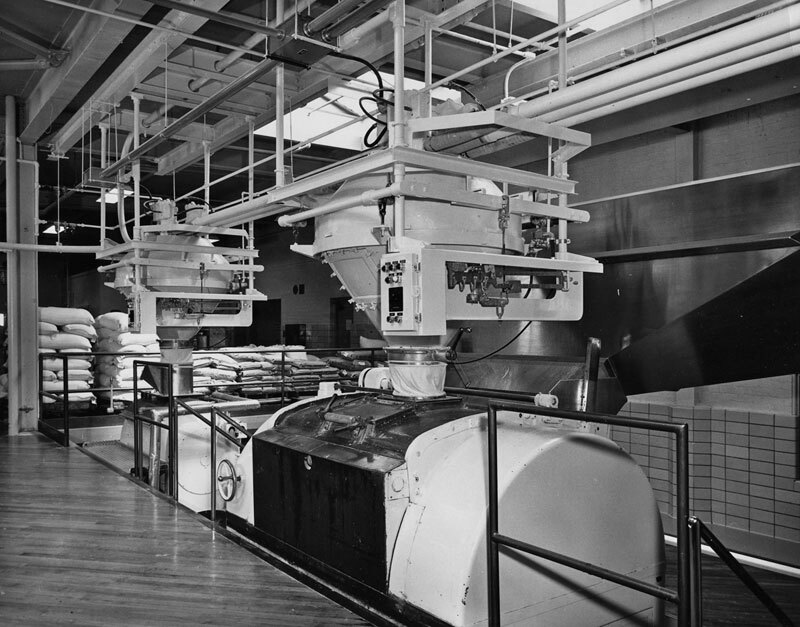 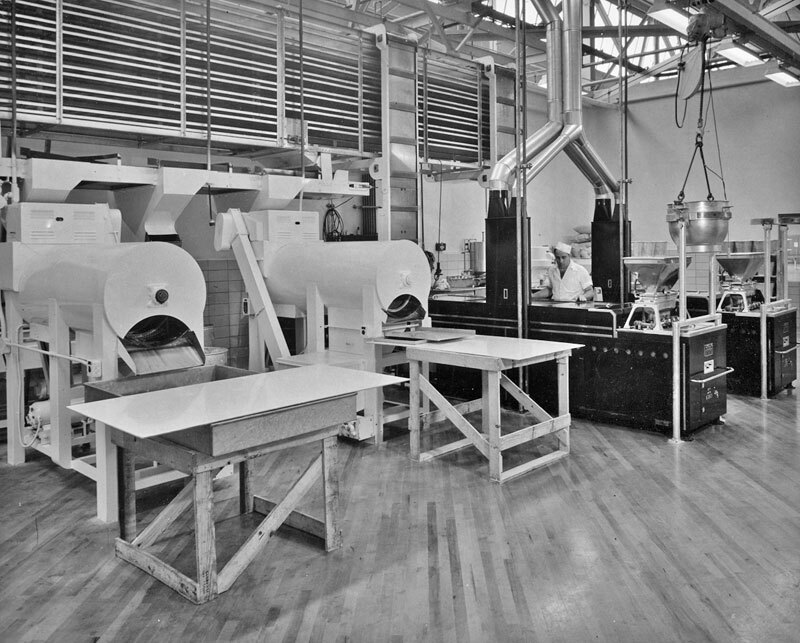 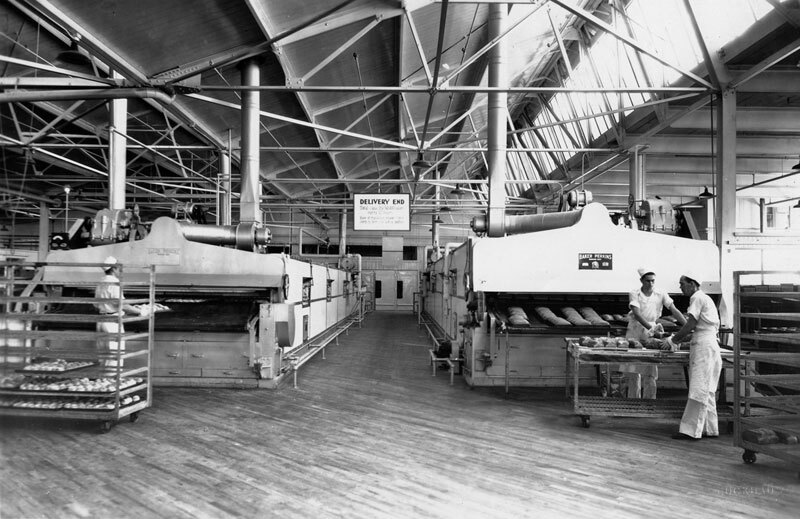 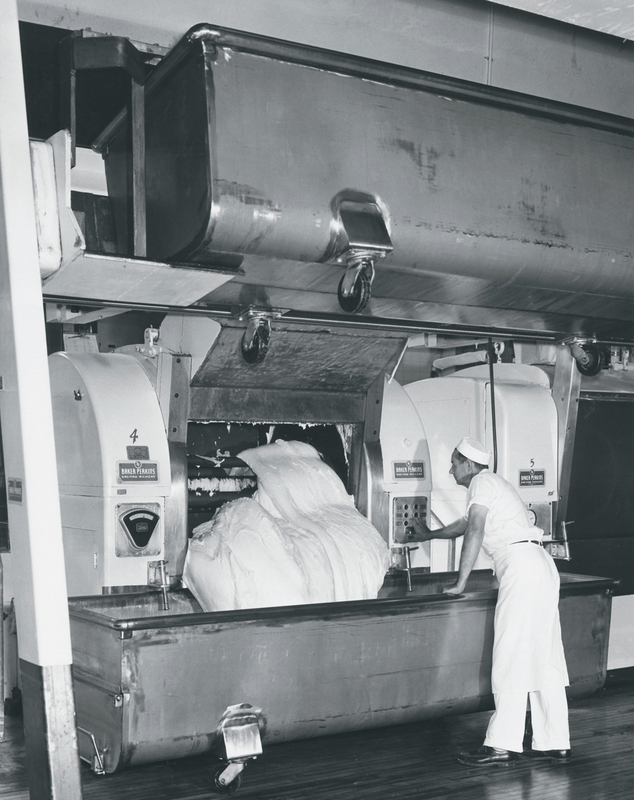 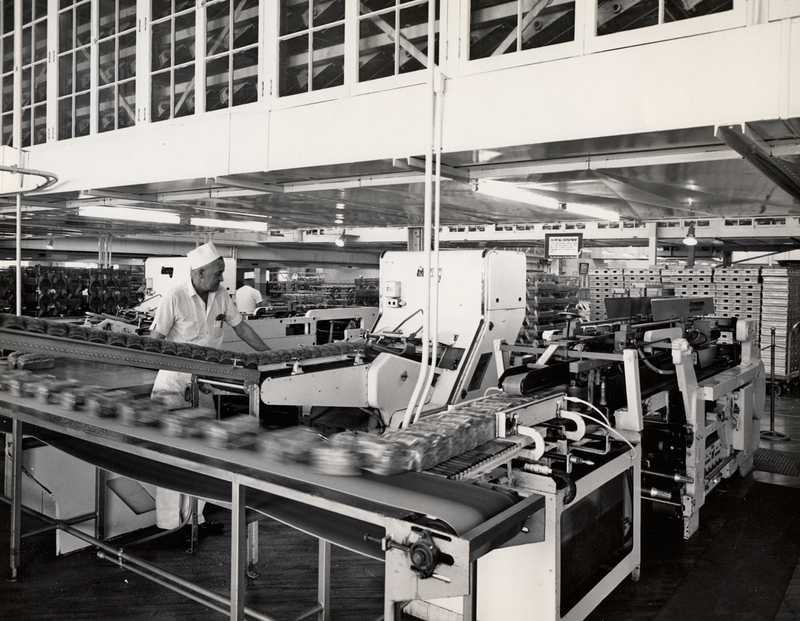 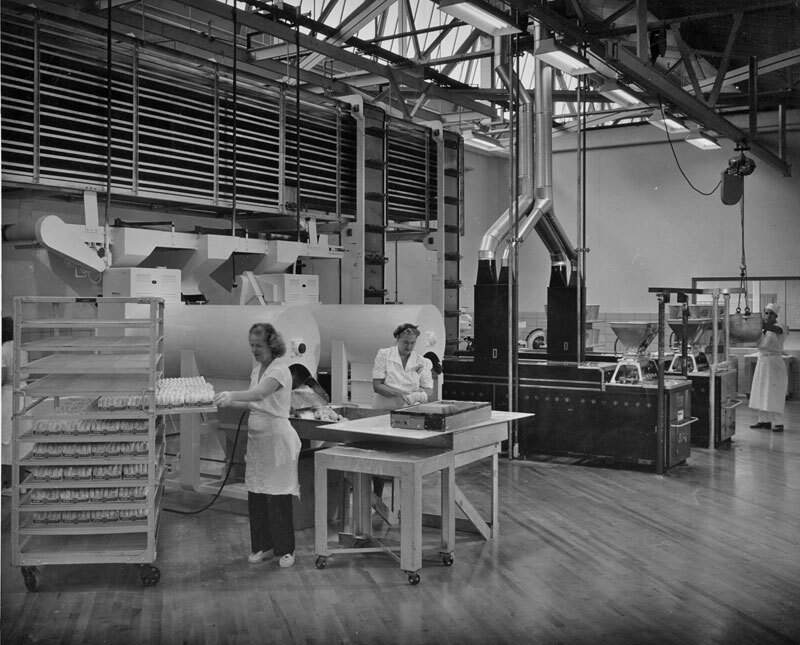 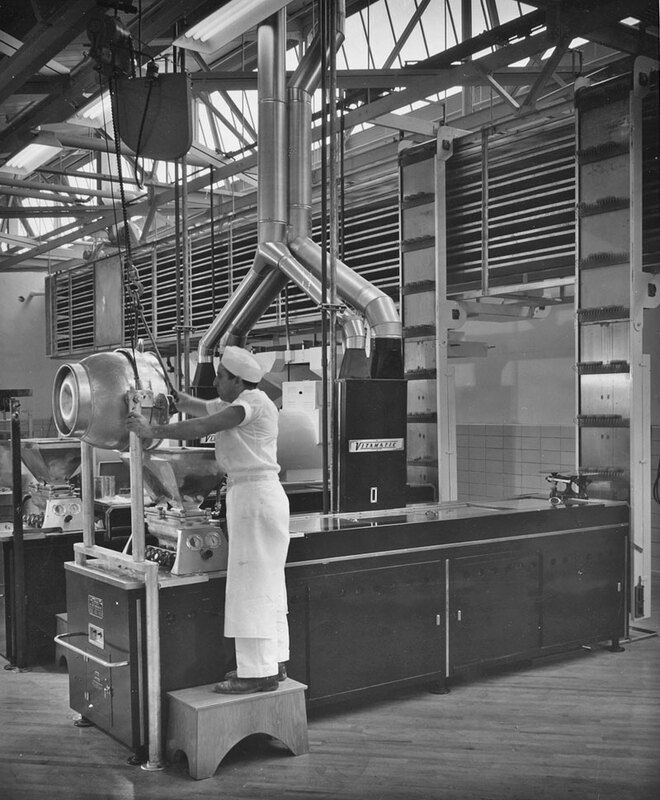 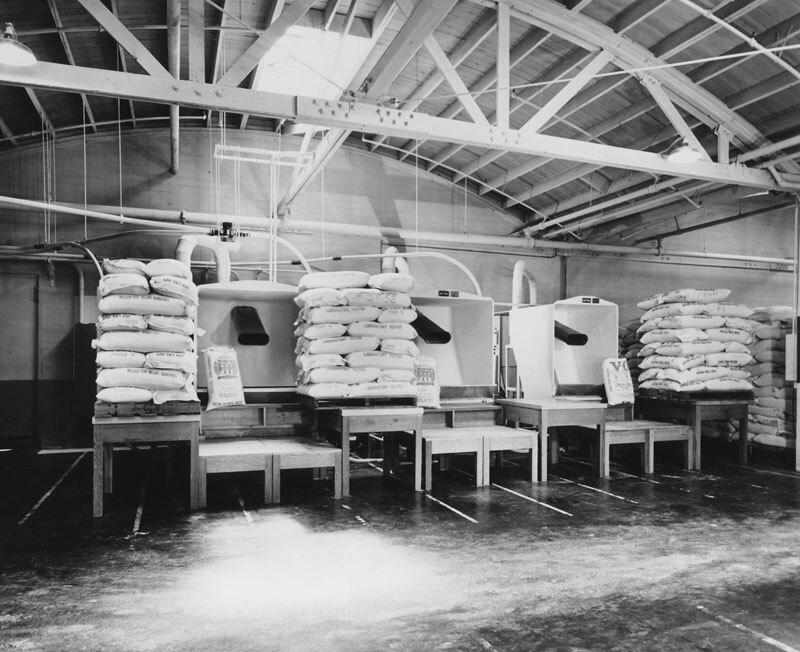 Loaves of baked bread on the conveyor ovens, 1952. 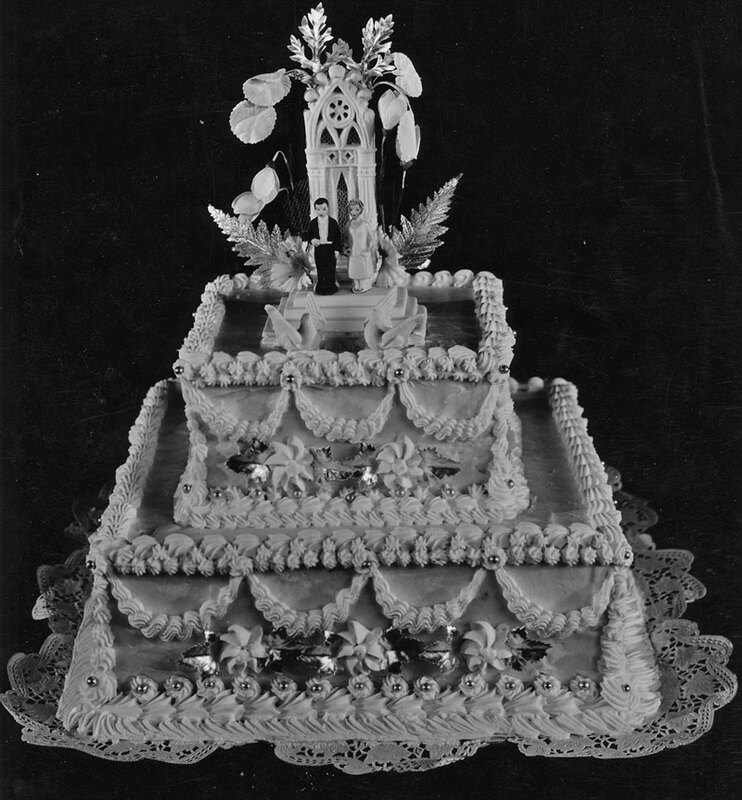 An original Helms Bakery wedding cake from the 30s. 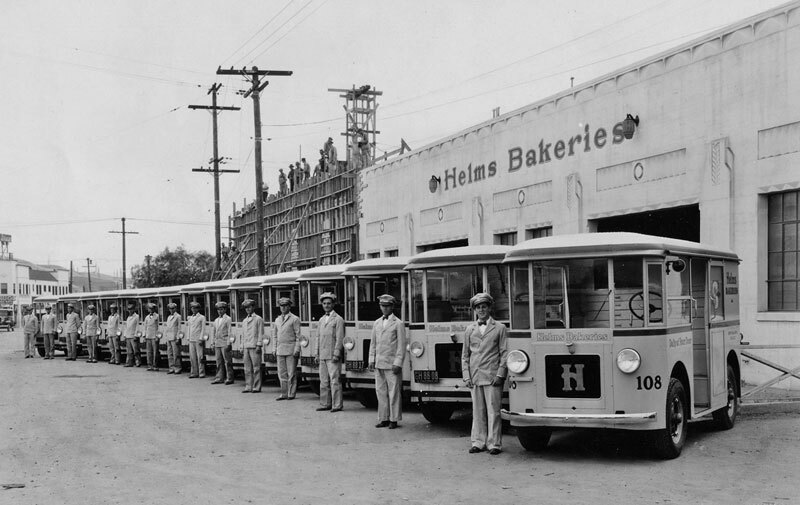 A lineup of Helmsmen and their coaches. 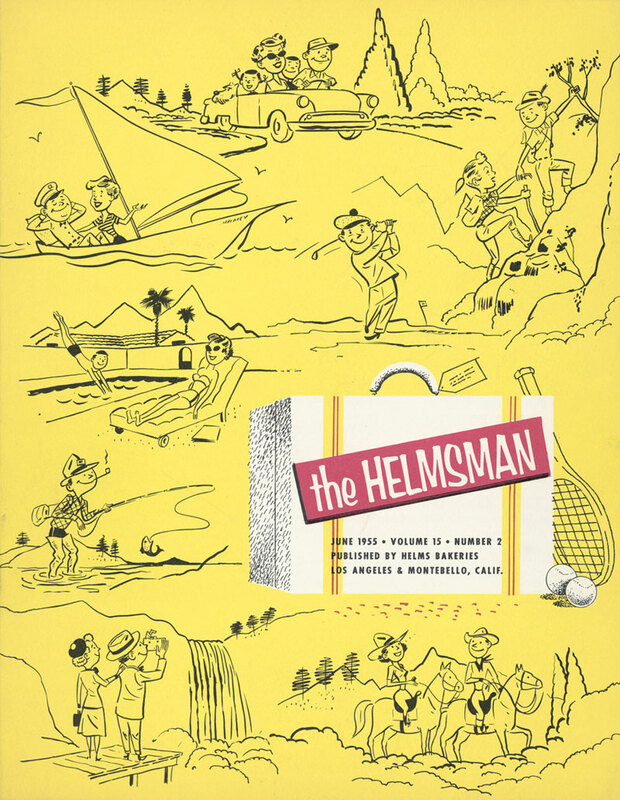 The Helmsman Magazine, March 1949. 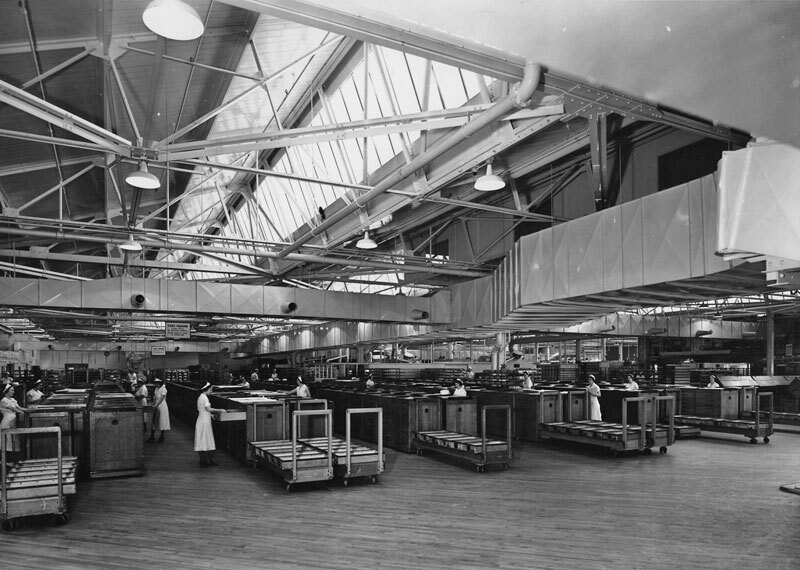 Inside view at the famous wooden draws from an original Helms coach. 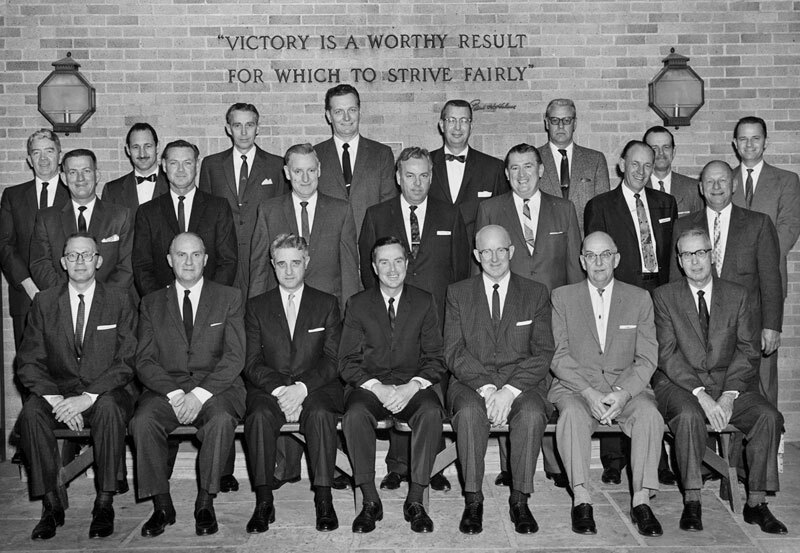 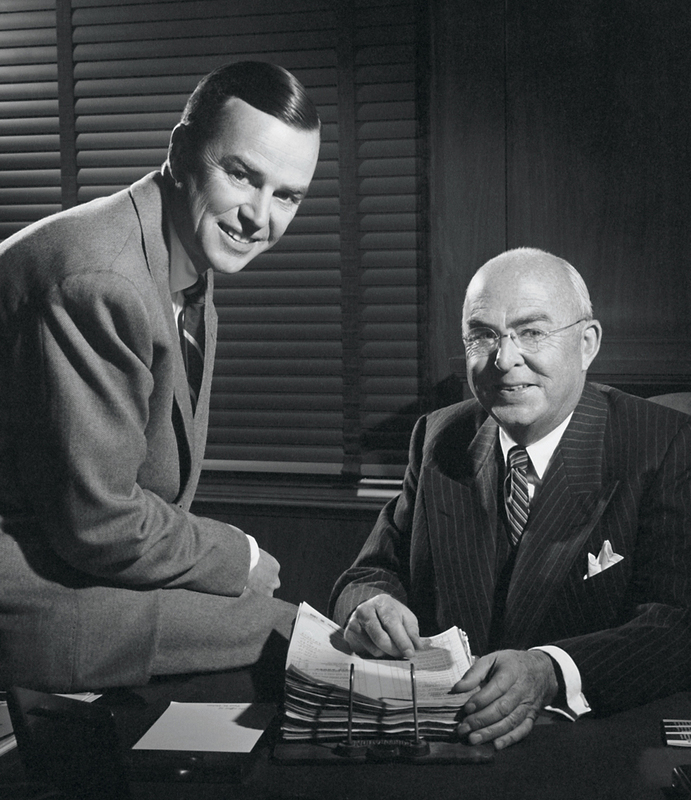 Paul Helms Jr. (seated center, front row) and staff. 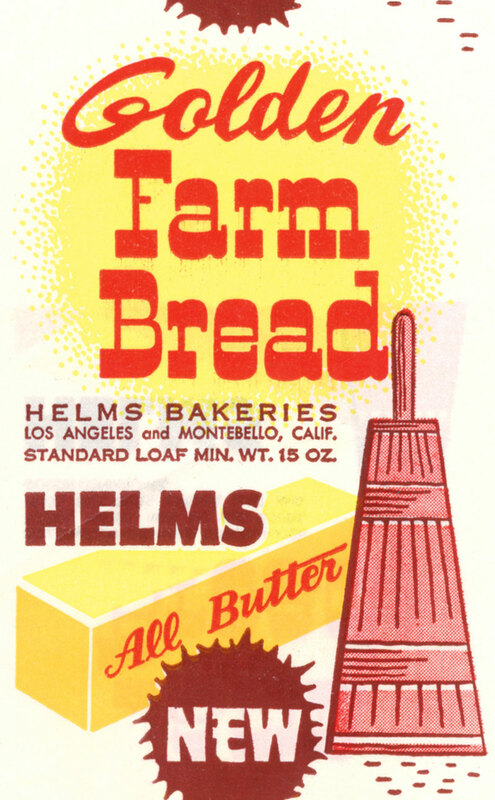 Bread label from the Montebello plant. 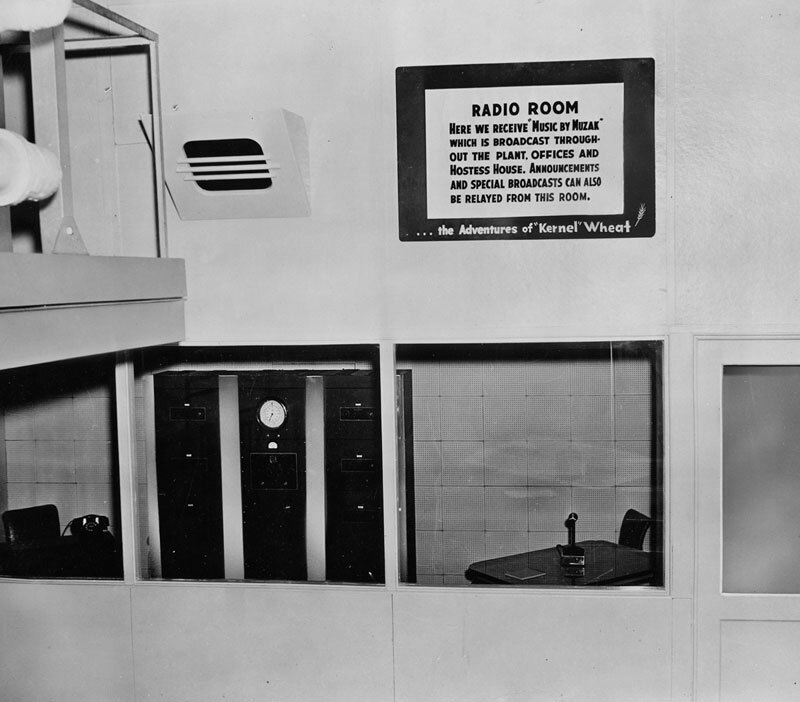 Muzak room...and the adventures of "Kernel" Wheat. 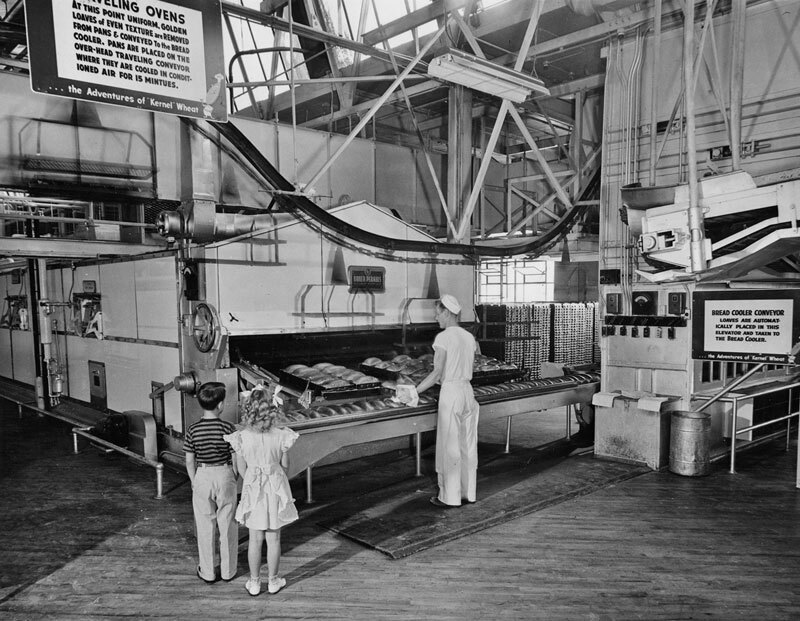 Children at one of the many school tours held by the Helms Bakery education program. 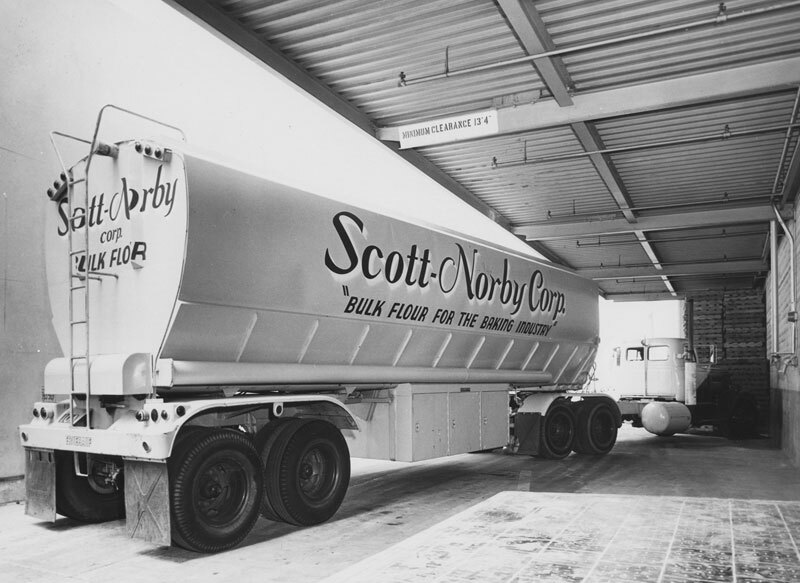 Unloading flour at the loading dock. 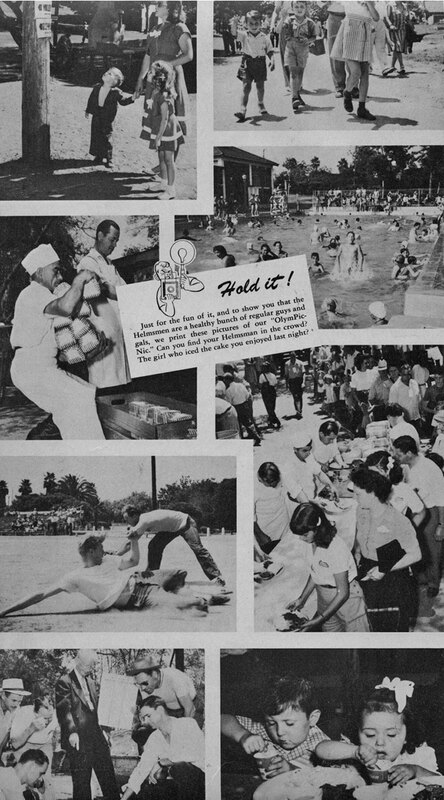 The bread line in action. 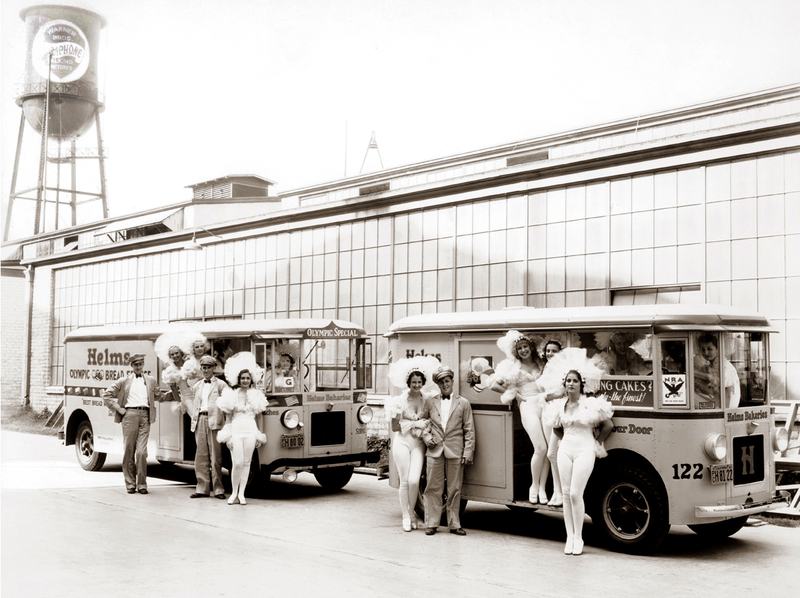 Helmsmen with showgirls on the lot of Warner Bros. studios. 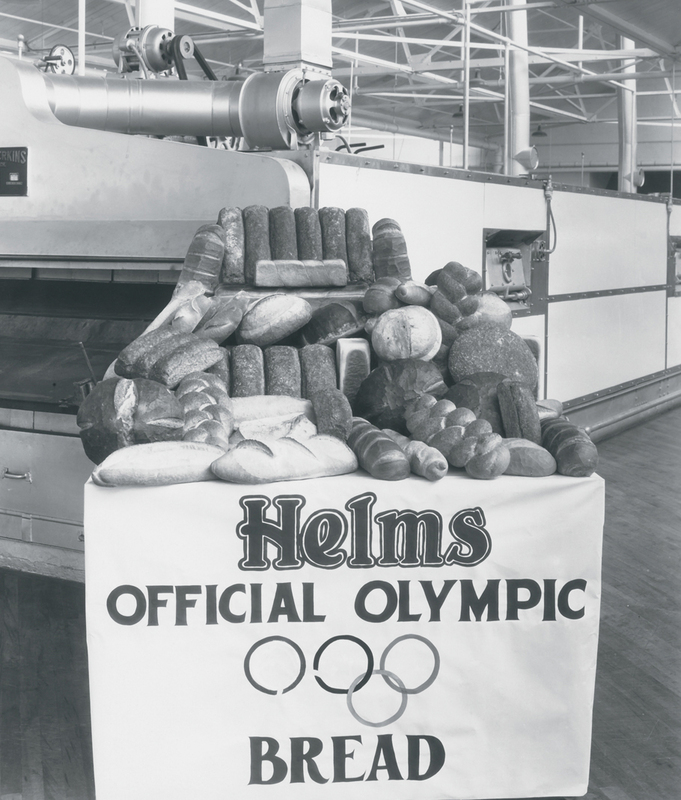 Loaves of Helms official Olympic bread. 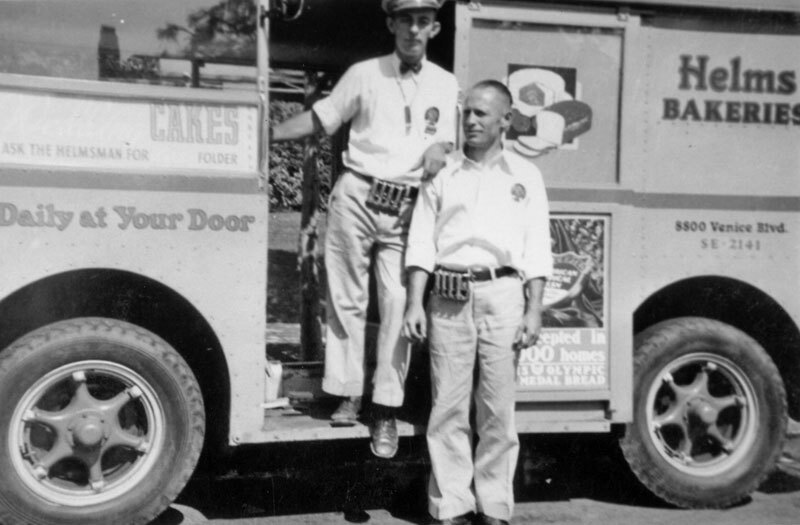 Paul Helms Jr. and Paul Helms Sr.
Helms Bakery 1st Annual banquet, March, 12th 1932.